Although Christmas is right around the corner, we understand that the wait can be excruciatingly tough and what better way to make time fly than with creating some incredibly cool DIY Christmas Ornaments? We have prepared a list of 111 Magical Christmas Ornaments that will cater to all kinds of budgets and tastes. So, without further ado, let us begin with a simple DIY project. Trust us; the list only gets better from here. Take a look at these amazing popsicle stick sleds. Impressive, aren’t they? This incredibly cute DIY project is not only inexpensive, but it hardly takes a few minutes to assemble. 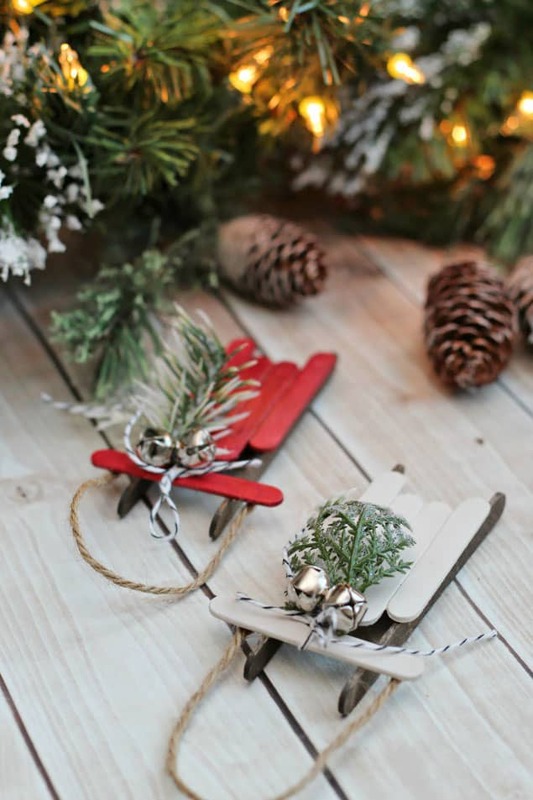 To get started with building your Popsicle stick sleds, you will require Popsicle sticks, 2 regular sized and 5 small ones per sled, wood glue, wood stain, red and white paint, twine, glue dots and decorative items (optional). If you are interested in learning more about this project, then click on the link mentioned below the illustration. Although Snow globes are readily available for purchase, none of them are fit for decorating Christmas trees. However, you can make your very own Snow Globe Christmas Tree ornaments which are not only inexpensive to create but also quite simple. 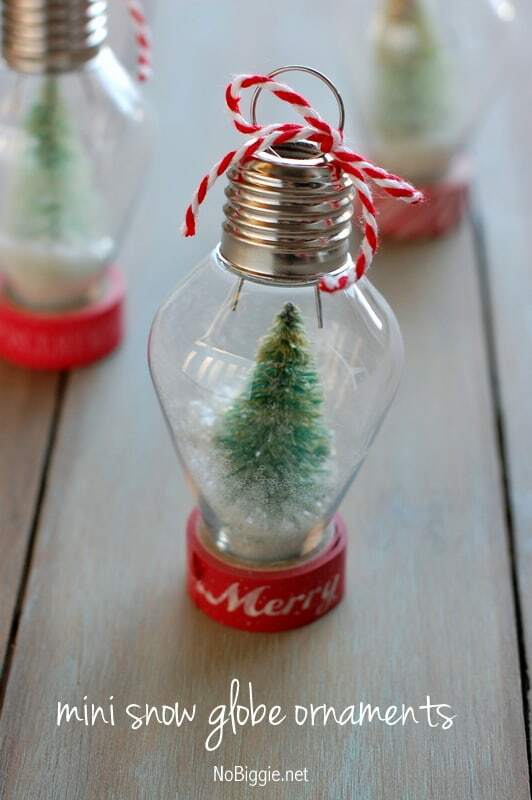 In fact, all you need is a pack of clear plastic old-fashioned Christmas light bulb ornaments, white glitter, mini bottle brush trees, red and white striped baker’s twine and glue. All the items mentioned are easily available, and more importantly, they are inexpensive as well. If you would like to bring this DIY idea to fruition, then follow the link mentioned below the illustration. Christmas is the time of the year when you go the extra mile to express your love for your near and dear ones. So, this DIY project is one simple way to embrace the special people in our life. For this project, you will require circular printed photos, twine, wooden discs, glue, and scissors. That’s all! We believe that the materials required for this project are not only readily available, but they are also inexpensive. If you are interested in learning more about this project, then follow the link mentioned below the illustration. 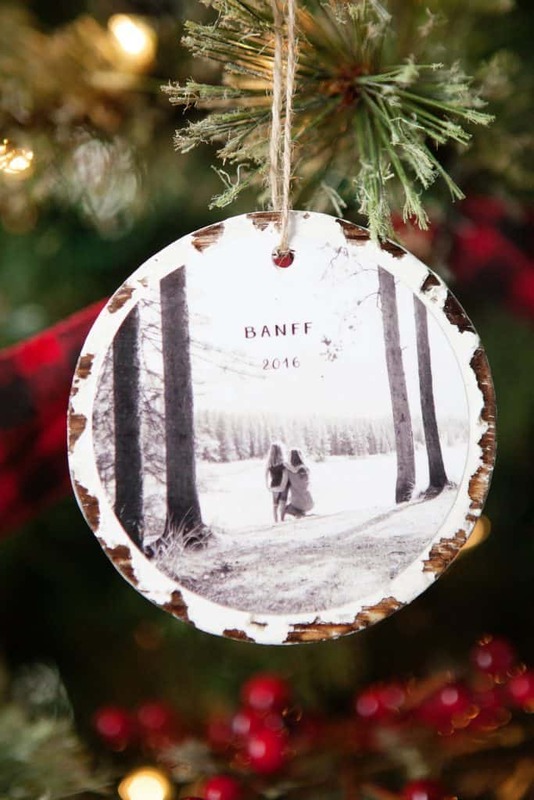 If you loved the last project featured on our list, then you surely need to check out this amazing DIY Photo Transfer Christmas Ornaments project. Unlike the former, the contents of the photo are transferred directly onto the wood using a matte gel medium. Sure, this DIY idea is not as simple as the last one; however, you cannot argue with the fact that this looks so much cooler. 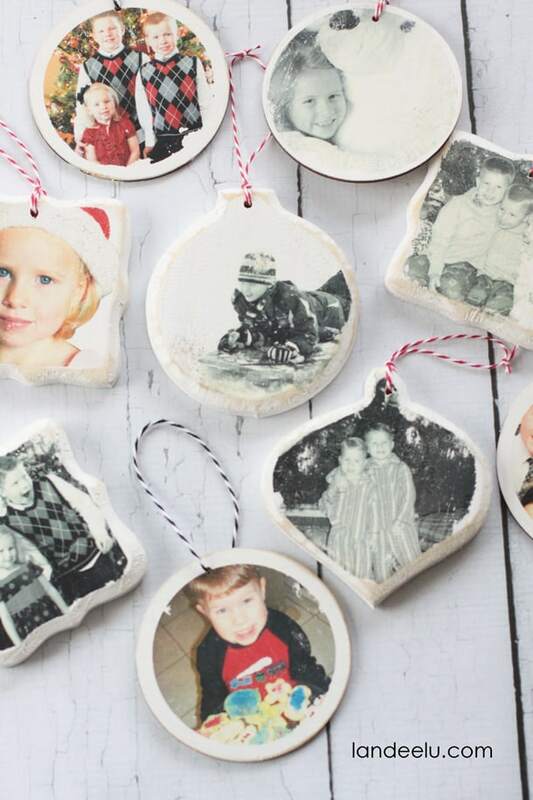 To get started with this project, you will require wooden craft ornaments, matte gel medium, white craft paint, family photos printed on a laser printer (no other type of printer will work), foam brushes, and twine. While the laser printer photos might be a little tricky to acquire, everything else on this list is readily available. 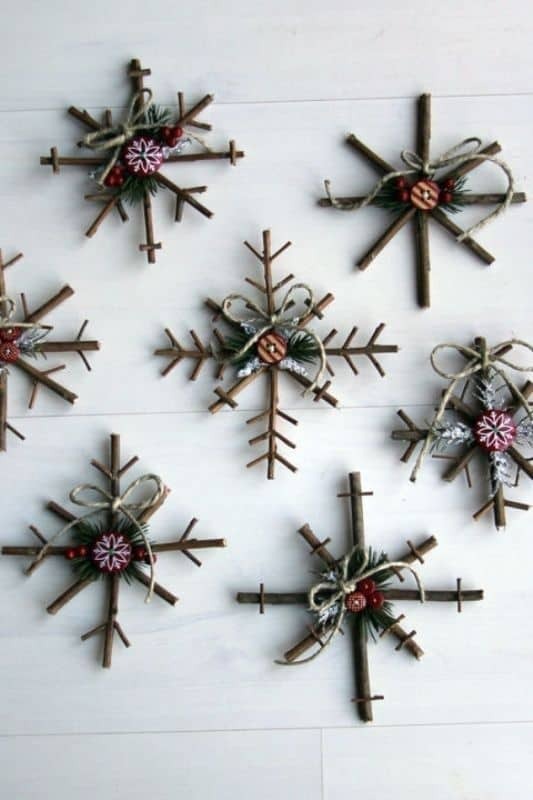 Take a look at these rustic snowflakes made from twigs and Christmas tree décor. They look quite cool on the wall, don’t they? Needless to say, these rustic snowflakes are incredibly simple to create, and they are easy on the wallet as well. 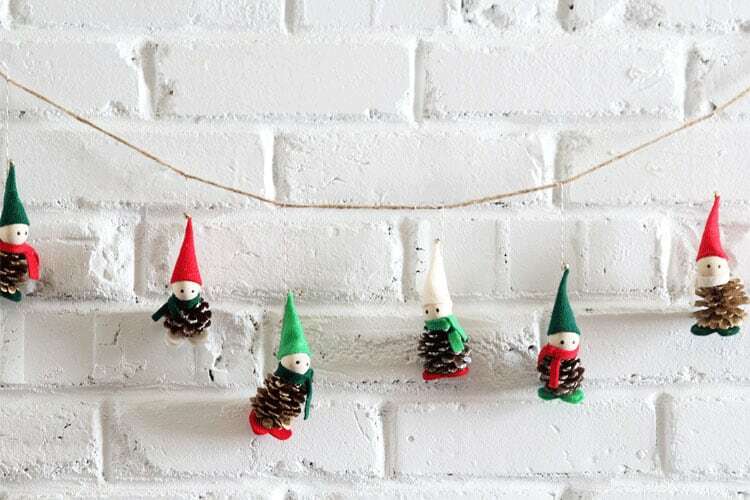 For this DIY project, you will require some wooden twigs, glue, a cutting tool, and Christmas tree ornaments. Once you gather everything, make a rough plan of your snowflake designs and start arranging the twigs accordingly. Glue the twigs together when you are satisfied with the design. After the glue has dried up, decorate your barebones snowflake with Christmas décor items. And,that’s it, you are done! If you manage to make rustic snowflakes, then do share it with us. We would love to see your work. If the last snowflake idea did not impress you, then this one surely will. 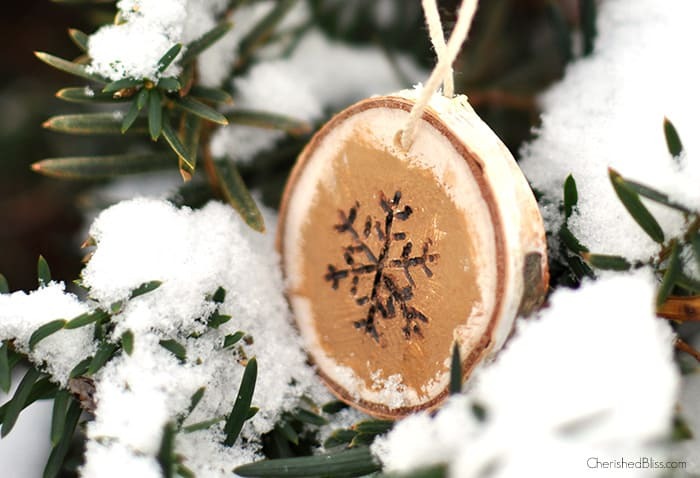 A few of these Wood Burned Snowflake Ornaments would be a fresh and lovely décor idea for your Christmas tree, don’t you think? However, we must say this is not quite as simple as the last idea. Having said that, we believe you can make this without much hassle. To get started with this project, you will require wood slices, acrylic paint, foam paint brush, wood burning tool, a template to trace, and an X-Acto knife. All the items are readily available, and you should not have much of a problem to acquire everything. If you are interested in learning more about this project, then click on the link mentioned below the illustration. You should surely pay a visit to this website; the creator, Ashley Thurman has done an amazing job explaining this DIY project. These whimsical reindeer heads made of wine cork will surely cheer up anyone who comes across them. Moreover, it is a simple project and one that you can do with your kids. 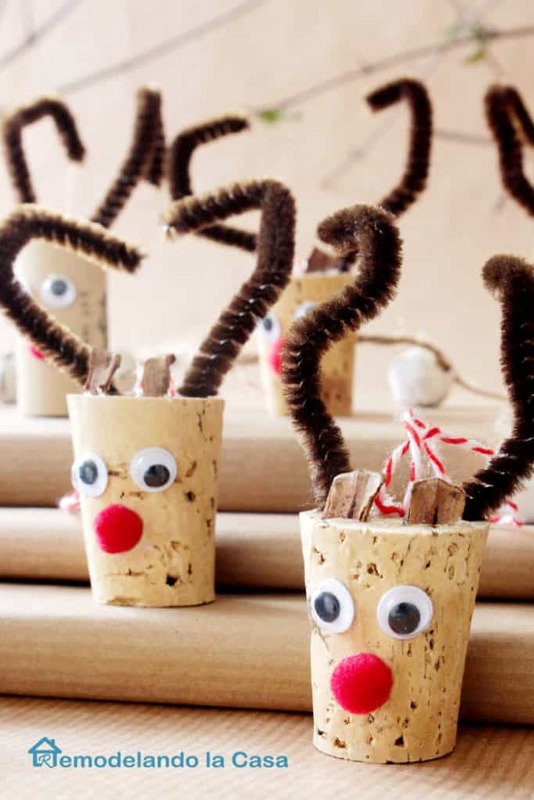 To get started with this DIY idea, you will need some wine corks, brown pipe cleaners, wiggly eyes, red pompoms, baker’s twine, pine cone scales, hot glue gun, and anawl tool. If you want to make these whimsical reindeer heads for Christmas, then follow the link mentioned below the illustration. There is no denying the fact that the versatility of mason jar lids is unmatched. 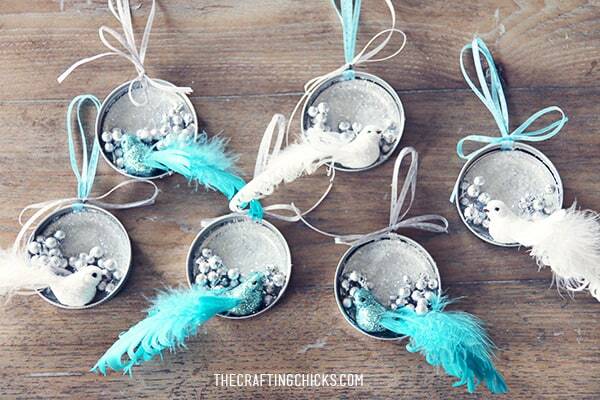 However, we bet you have not seen tree ornaments made of mason jar lids. They look really cool, don’t they? The materials list required for this project is quite simple, and all you need are a few mason jar lids with screw rings, scraps of fabric, glue gun, scissors, twine, and some Christmas themed cutouts. If you are interested in learning more about this project, then we suggest you click on the link mentioned below the illustration. Why waste money on boring Christmas wreaths, when you can make this very cool mini woodland wreath ornament? 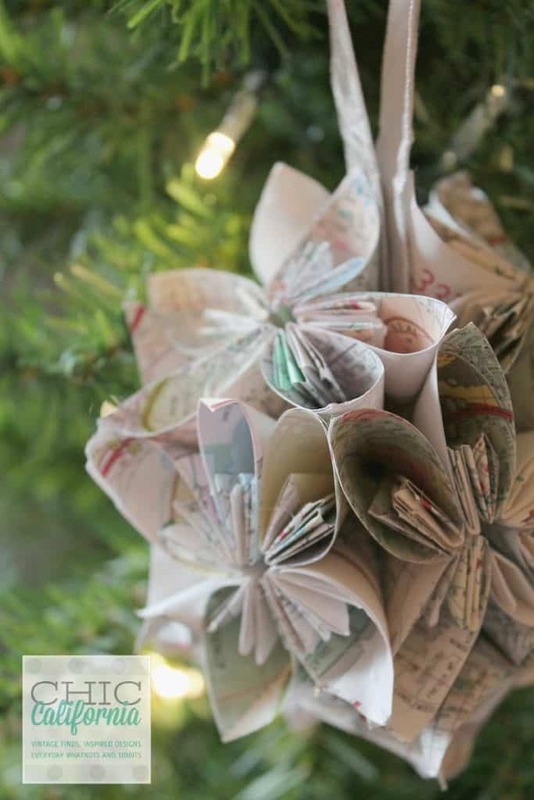 Not only does it add a rustic charm to your Christmas tree décor, but this unique idea is also a breath of fresh air. 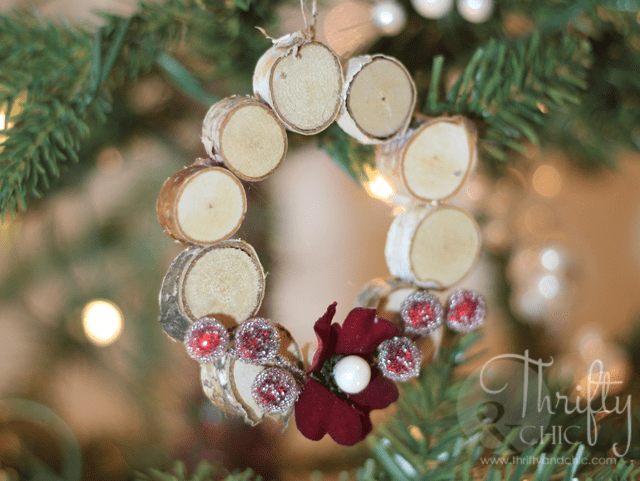 For this DIY project, you will require wooden disks, hot glue gun, and some Christmas ornaments. That’s it! This is surely one of the simplest materials lists for a DIY project you will ever come across. If you are interested in creating these amazing mini woodland wreath ornaments, then follow the link mentioned below the illustration. If you love knitting and making cool stuff out of yarn, then you surely need to check out these amazing Homemade Christmas Star Ornaments. Even if you are not adept at knitting, we believe that you can bring this idea to fruition, albeit with a little time and effort. To get started with this DIY idea, you will need corrugated cardboard, tape, yarn in multiple colors of your choice, pins, and scraps of patterned paper (you can also use images of your loved ones). 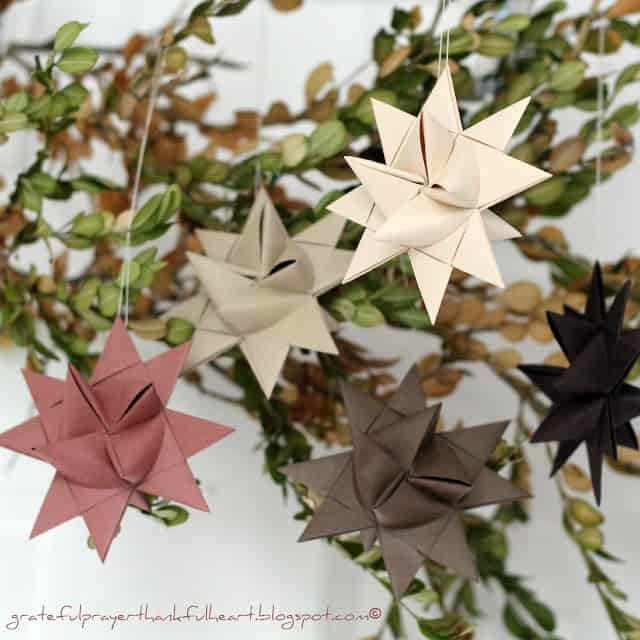 If you want to create these amazing DIY Star Ornaments to decorate your Christmas tree, then follow the link mentioned below the illustration. Who would have thought something so wonderful couldbe created from these rather unassuming K-Cups? Not only do they make wonderful Christmas Tree ornaments, but this DIY project is quite light on the wallet as well. For this project, you will require used K-Cups, an empty snack box, circle punch, black spray paint, and ahot glue gun. In addition to that, you will also need twine, trim and embellishments, scissors, and last but not least, a craft knife. If you want to learn the detailed step-by-step procedure for creating these wonderful ornaments, then click on the link mentioned below the illustration. Although we have already featured a Popsicle Stick Sled Project earlier on this list, this one has a different construction. In fact, if you are planning on decorating your Christmas Tree with popsicle stick sleds, then this project will surely come in handy. 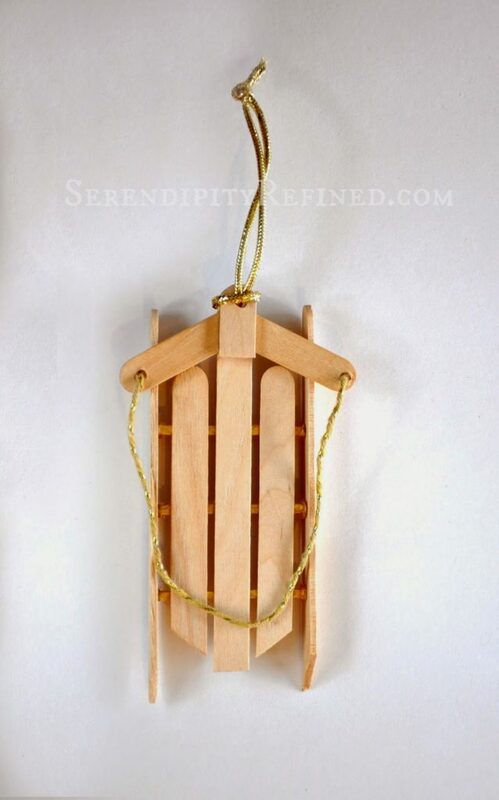 To get started with making your Popsicle Stick Sled, you will require 6 popsicle sticks, twine, gold cord (optional), 3matchsticks, and paint (optional). In addition to that, you will also need an X-Acto knife, cutting board, hot glue, paint brush, and scissors. If you want to learn more about this project, then follow the link mentioned below the illustration. 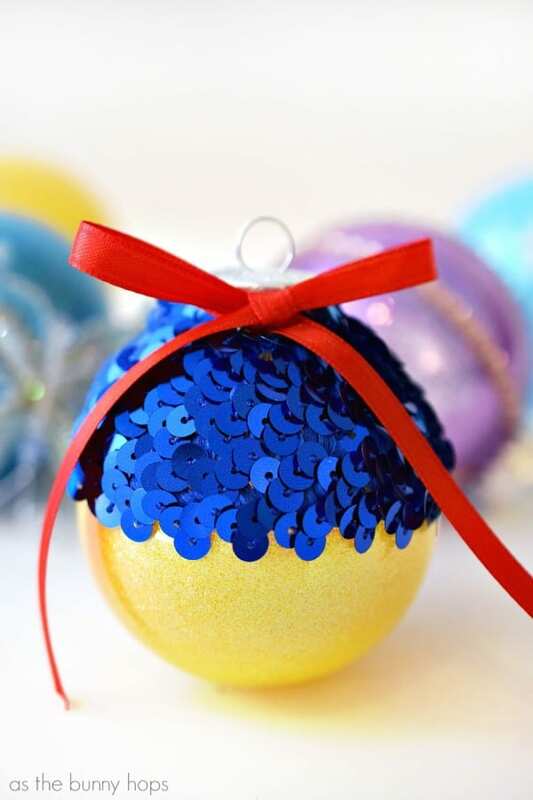 Take a look at these Glittery String Ball Ornaments. They look amazing, wouldn’t you agree? Although this idea looks quite sophisticated, it is actually quite simple to create. In fact, this is an amazing DIY project for kids. For this DIY idea, you will require two buckets, string, glue, balloons, glitter, and scissors. Needless to say, every item is extremely common and light on the wallet as well. If you are interested in learning more about this DIY project, then click on the link mentioned below the illustration. Although these cute Scandinavian-StyleFelt Christmas Tree Decorations look quite simple and straightforward, they require a bit more expertise than the projects featured earlier on this list. In fact, you need to be comfortable with some basic stitching techniques to execute this DIY idea. To get started with this project, you will require a 9-inch x 9-inch square sheet of bright red felt, scraps of white felt, red and white stranded cotton embroidery threads, and pins and needles. In addition to that, you will also need a disappearing fabric pen, a soft pencil, scissors, polyester filling, and finally, narrow red and white ribbons. If you think you can bring this DIY idea to fruition, then click on the link mentioned below the illustration to learn more about this project. While the last reindeer project only featured the head, this one goes for the full package. Moreover, it is a tad bit simpler to execute than the former. 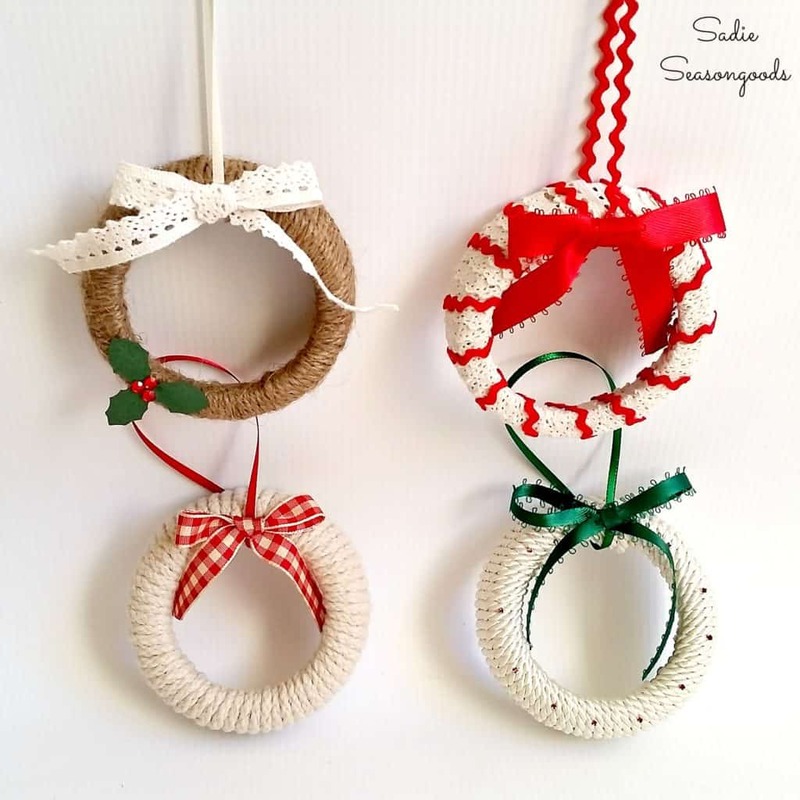 For this project, you will require two and a half wine corks, some fabric scraps, a short strand of twine, and finally, a tiny red ball Christmas ornament. In addition to that, you will also need some glue and a pair of scissors. Who would have thought bottle caps could look so pretty? The DIY Bottle Cap Snowman Ornaments project is not only a unique way to decorate your Christmas tree, but it is also super easy to make. Even the materials list is one of the simplest featured here. In fact, all you need are bottle caps, white, black, orange, and red acrylic paint, paint brushes, ribbons, hot glue gun, buttons, and scissors. All of the items are readily available, and you might even have some of these lying around in your house. If you want to make your very own army of Bottle Cap Snowmen, then follow the link mentioned below the illustration. 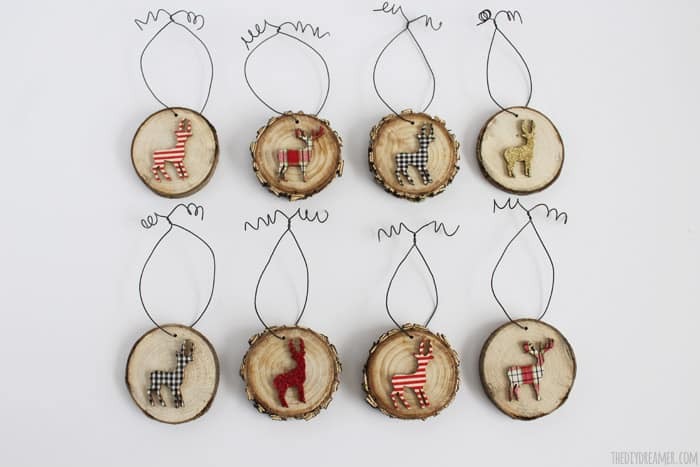 Take a look at these Deer Wood Slice Ornaments. They look charming, don’t they? 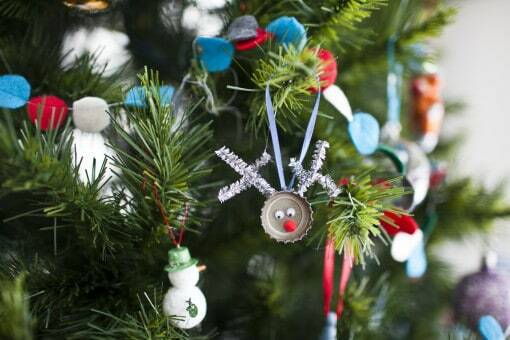 Although these ornaments look quite sophisticated, they are extremely simple to make. In fact, you only need wood slices, reindeer clothespins, paintbrush, wax paper, hot glue gun, wire and wire cutters, to get started with this project. If you are interested in learning more, then click on the link mentioned below the image for the detailed step-by-step instructions for this project. 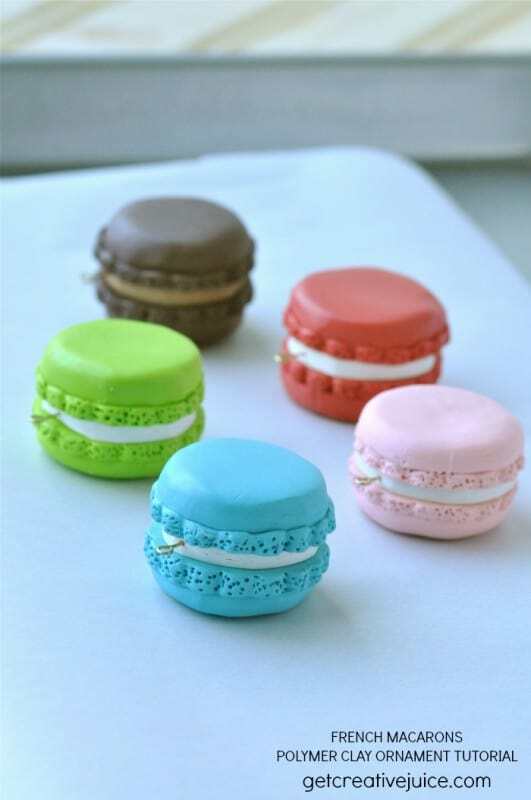 Although these colorful French Macaroons look incredibly delicious, they are not edible. That is not to say that they do not make wonderful Christmas ornaments. However, since they look so appetizing, be sure to keep them away from the reach of children. For this DIY project, you will require polymer clay in a few colors, metal hoop eye pin screws, and a small scalloped cookie cutter. All of the items are readily available and you should not have a problem in acquiring everything for this project. If you are interested in learning how to make these lovely French Macaron Ornaments, then click on the link mentioned below the illustration. If you are tired of decorating your Christmas tree with stars, then you should surely check out this amazing DIY idea. Although this project is quite simple, making a dozen or so snowflakes out of wooden clothespins will be quite tedious. However, if you can manage to do it, it will be totally worth it. To get started with this DIY idea, you will require wooden clothespins (8 for one snowflake), and some hot glue. That’s it! This is surely one of the simplest list of materials featured here. If you are interested in learning more about these understatedly cool clothespins snowflakes, then click on the link mentioned below the illustration. If you loved the simplicity of the last project, then you will surely appreciate this Beautiful Vintage Map Ornament as well. However, we must say that this DIY project requires a lot of patience, but it is well worth the effort. Just like the last project featured on our list, this DIY idea also has a simple materials list. In fact, you only require a hot glue gun, a ribbon for hanging the ornament and 55 3-inch squares cut from the vintage map. If you love this DIY idea, then click on the link mentioned below the illustration to learn more about this wonderful project. 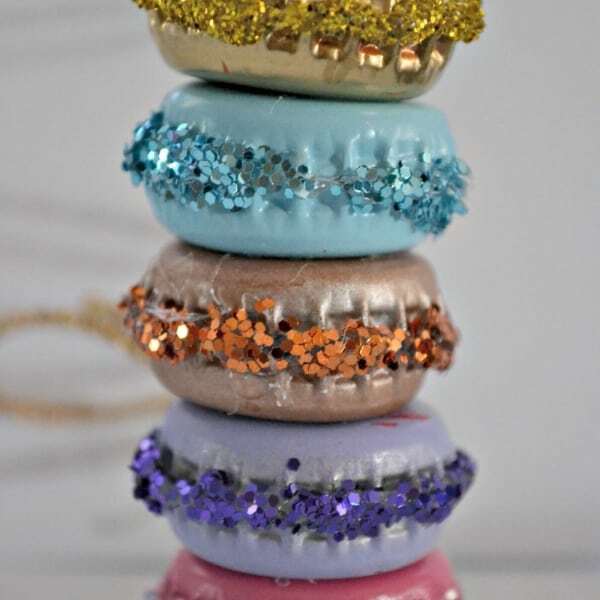 Feast your eyes upon these incredibly cute and cheerful DIY Sprinkles ornaments. They look quite stunning, don’t they? 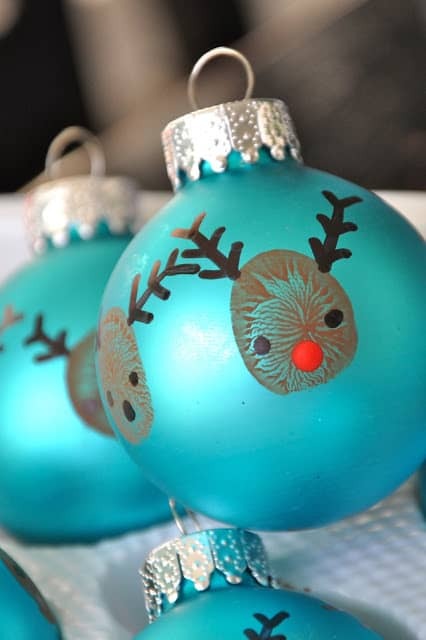 Moreover, they are quite simple to create and look much better than the normal Christmas ball ornaments. 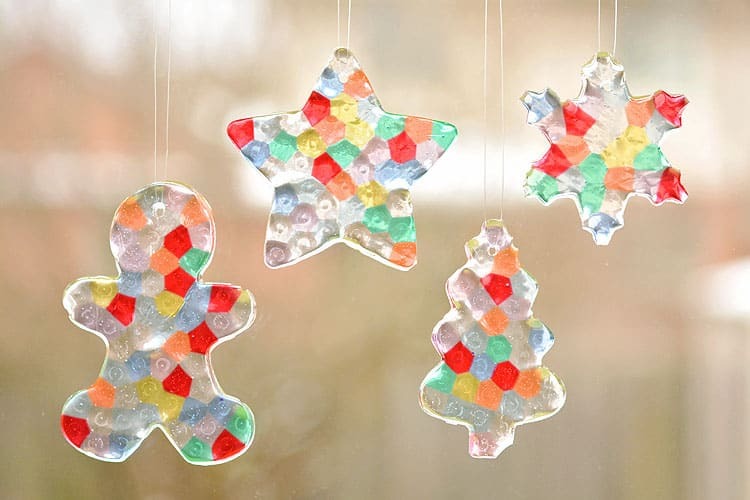 To get started with this project, you will require colorful sprinkles, varnish, clear glass or plastic ornaments, and ornament hooks. All the items are easily available, and you should not have a problem in acquiring everything. If you want to make these Sprinkles Ornaments to adorn your Christmas tree, then click on the link mentioned below the illustration for the detailed step-by-step instructions. If you thought that the last project looked incredibly cute, then wait till you feast your eyes on this one. 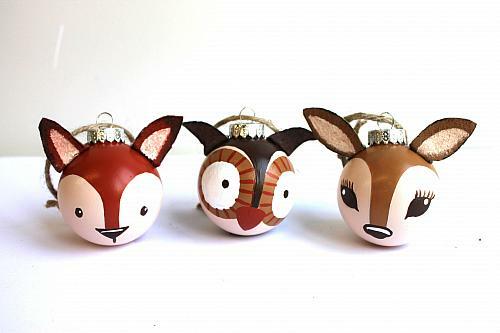 These woodland ornaments are overflowing with cuteness, wouldn’t you agree? While this project may not be as simple as the last one, it is well worth the time and effort. Since the creator of this project has provided a very detailed list of materials, we suggest you check it out by clicking on the link mentioned below the illustration. Needless to say, the step-by-step instructions for this DIY project is also present there. Here is another wonderful project from decoart. 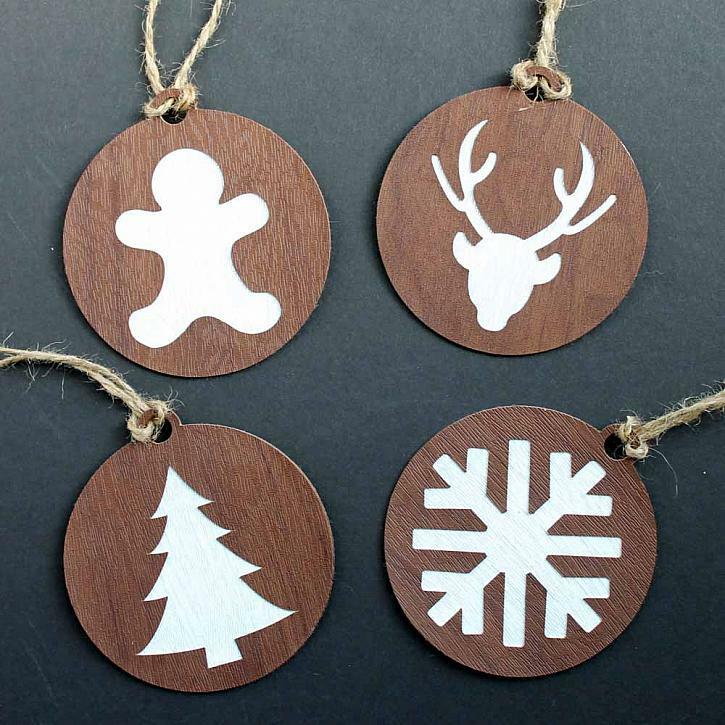 Not only do these wood grain leather ornaments look classy and minimalistic, but they are also quite simple to create. To get started with this project, you will require DecoArt Patent Leather White paint, Cricut Faux Leather with Wood Grain, Cricut MakerMachine, Cricut Cute File, tacky glue, twine, scissors, and paintbrush. Although some of the materials mentioned are from Decoart or Cricut, you can always get similar items from elsewhere. If you have pets, then you will know that they are not only companions, but they are also an integral part of the family. So, why not involve your pets in making your Christmas tree ornaments? 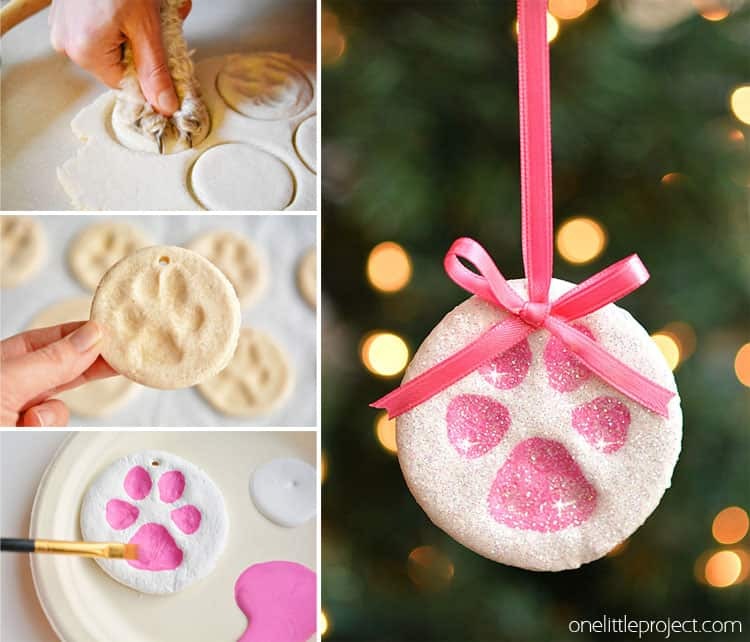 The Paw Print Soft Dough Ornaments project is one amazing way to do so. To get started with this project, you will require salt, water, flour, matte finish mod podge, paint, glitter, and gold paint pen or sharpie. Most of the items mentioned are already present in your home,and you should not have any trouble gathering the rest of the materials as well. 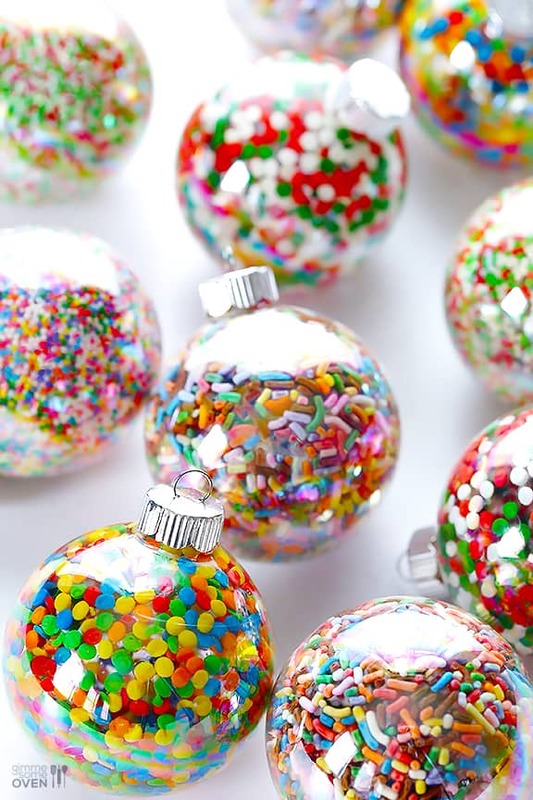 These melted bead ornaments look absolutely stunning, don’t they? Although these ornaments look quite sophisticated, the creation process is actually one of the simplest featured on this list. In fact, there is no cutting, drawing or painting involved. For this amazing DIY idea, you will require clear pony beads, metal cookie cutters, fishing lines and a drill with a1/8-inch drill bit. Pretty simple, right? If you are interested in learning more about this amazing DIY project, then click on the link mentioned below the illustration. We bet you will love it. If you loved the last project featured on our list, then you surely need to check out this amazing DIY idea. Just like the former, you need to melt stuff in the oven with the help of metal cookie cutters. It is the exact same process, albeit with peppermint candies instead of plastic beads. 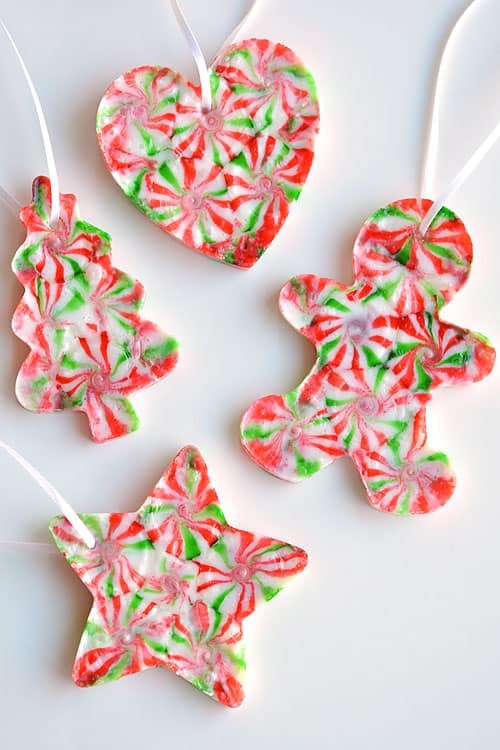 To get started with this project, you will require peppermint candies, metal cookie cutters, parchment paper, toothpick, and ribbon. The list of materials is quite similar to the last project, and you should not have any trouble acquiring all the items. If you love this DIY idea, then click on the link mentioned below the illustration to get the detailed step-by-step instructions. Needless to say, the best part of this project is that you can not only use the finished products as ornaments but also eat them. 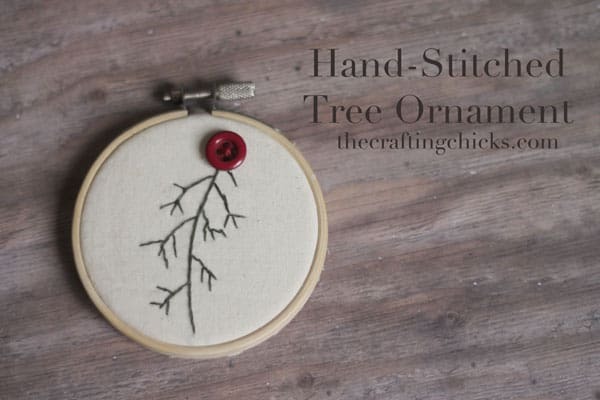 Take a look at this beautiful hand-stitched tree ornament. It looks quite elegant, wouldn’t you agree? Although this DIY project requires some hand-stitching, we believe you can do it without any prior experience in the field. Needless to say, the list of materials needed for this DIY idea is quite simple. In fact, you only require a 3-inch wooden embroidery-hoop, a small scrap of material, fabric marking pen or pencil, embroidery floss, needle, and a colorful button. If you are interested in learning more about this wonderful DIY project, then follow the link mentioned below the illustration. Who would have thought that pom-poms and pine-cones make such a great pair? The Pom-Poms and Pine-cones Christmas Ornaments not only look enchanting on the Christmas tree, but they are also simple to make. 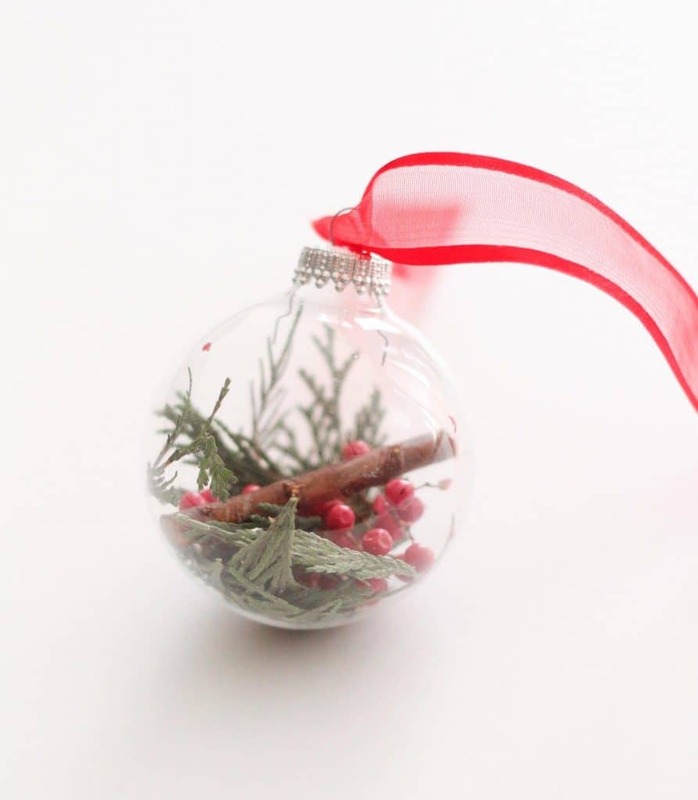 In fact, you only need dried up pine-cones, tiny pom-poms, string or ribbon, and a hot glue gun. That’s all! Moreover, the creation process is almost as simple as the list of materials for this DIY idea,and you hardly need a few minutes to complete a single ornament. Although this project is quite straightforward, we suggest you visit the link mentioned below the illustration to learn more about it. Here is another ingenious idea which is even simpler than the last project featured on our list. In fact, the simplicity of the project makes it seem like electronic tea lights were built to serve this purpose. To get started with this DIY project, you will require battery-operated tea lights, black sharpie, red ribbon, and red pipe cleaners. In addition to that, you will also need red pom-poms, black felt, orange sharpie, and a glue gun. While the materials list may not be as short as the last few products featured on this list, all the items are readily available and inexpensive as well. We have featured a few Popsicle stick DIY projects; however, none of them are quite as cute or special as this one. Moreover, the beauty of this project lies in its simplicity. 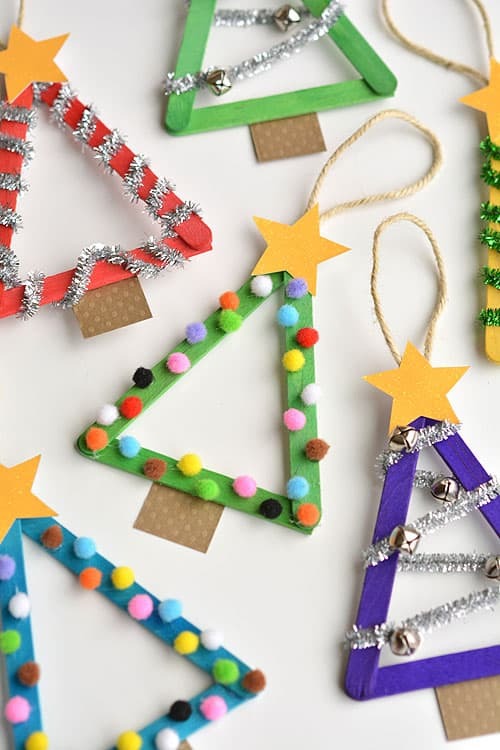 In fact, to get started with this DIY project, you only need Popsicle sticks (3 for each Christmas Tree), 1-inch x 1-inch square of brown card stock, a star cut from glittery card stock, twine, hot glue gun, and a cutting tool. For the decoration, you can use tiny pom-poms, sparkly pipe cleaners, jingle bells, rhinestones, buttons, and glitter. The creator of this project has gone into great depths to explain it, and we suggest you click on the link mentioned below the illustration to learn more. Take a look at these whimsical pinecone reindeers. They will surely cheer anyone up, wouldn’t you agree? Moreover, they are quite simple to create, and you can even work on this DIY project with your kids. 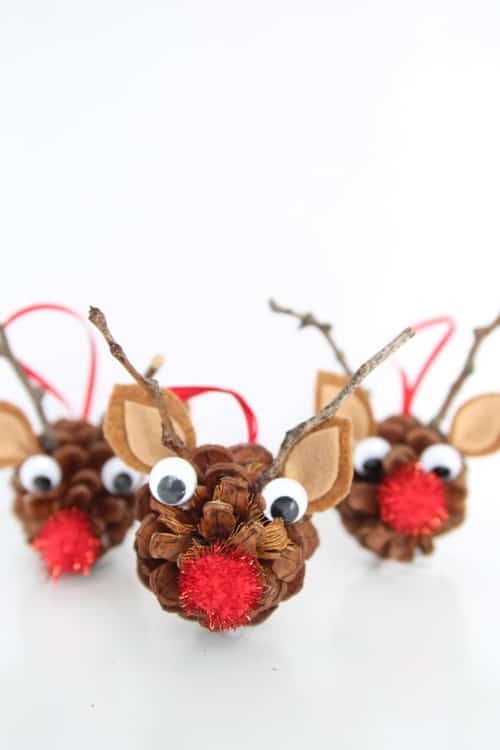 For this DIY idea, you will require dried up pinecones, googly eyes, large red pom-poms, brown felt, hot glue gun, red ribbon, and some twigs. All the items are easily available,and more importantly, they are light on the wallet. If you are interested in the detailed step-by-step instructions for this project, then click on the link mentioned below the illustration. The versatility of Popsicle sticks means that we are not done with them. Not even close! If you are tired of decorating your Christmas Tree with mainstream ornaments, then you surely need to check out this DIY idea, along with the other epic popsicle projects featured here. The materials list for this DIY project is extremely simple. In fact, all you need are large popsicle sticks, black, white, and red paint, cotton balls, pom-poms, paintbrush (a Q-tip will work as well), hot glue gun, and ribbon. If you love this DIY idea, then click on the link mentioned below the illustration to learn more about it. 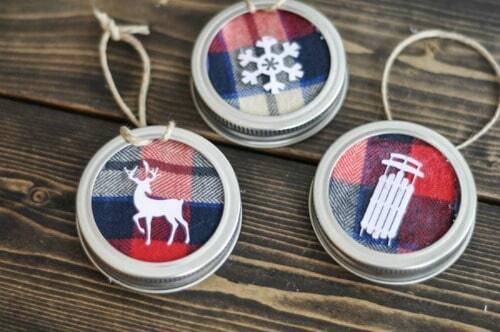 Feast your eyes upon these amazing Mason Jar Lid Ornaments. They look stunning, don’t they? Although these DIY Christmas ornaments look quite sophisticated, they are surprisingly simple to create. 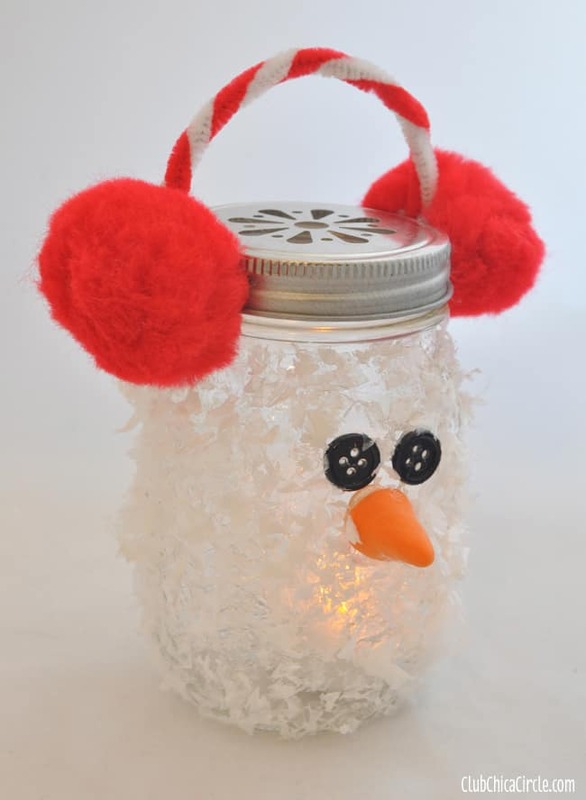 In fact, to get started with this project, you will only need mason jar lids, Creatologywhite glitter, hot glue, mini bird clips, silver berries, and ribbon. We are quite certain that you are itching to learn more about this project. So, click on the link mentioned below the illustration to get the detailed step-by-step instructions for this wonderful DIY idea. These colorful ornament piñatas not only look amazing, but they can also be a lot of fun for a Christmas party. However, we must say that despite its simple appearance, this project is deceptively hard to create. In fact, you need a lot of patience to bring this DIY idea to fruition. For this DIY idea, we require a cardboard, colorful tinsel garland, gold tinsel garland, masking tape, and hot glue. In addition to that, you will also need paper towel roll, scissors, pencil, a large bowl, awl, and finally, ribbon. The creator of this project has gone into great depths to explain it, so we suggest you click on the link mentioned below the illustration for the detailed step-by-step instructions. If you are all about the minimalistic life, then you surely need to check out this amazing DIY project. 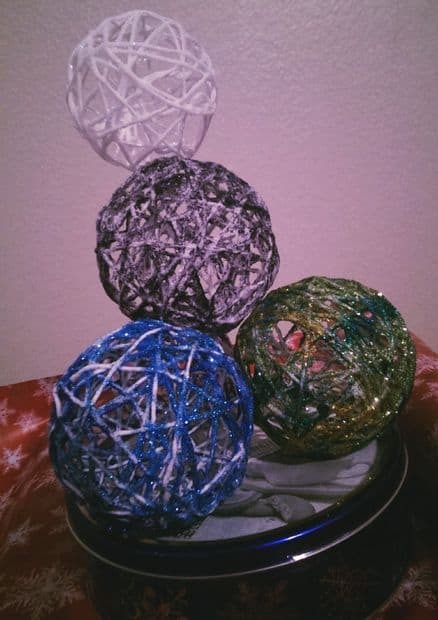 These Paper Ball Ornaments not only look classy, but they are also easy to make. Moreover, the list of materials required for this project is one of the simplest among all the DIY projects featured here. In fact, for a single ornament, you only need six (3/4-inch x 10-1/2-inch) strips of paper or card stock, 6 inches of wire, two wood beads and twine/ribbon. If you are interested in learning more about this amazing DIY project, then click on the link mentioned below the illustration. While the last project was minimalist, this one lies more on the ostentatious side. Although these stunning jingle bells Christmas ornaments look quite sophisticated, you need even less time and effort compared to the last project. On top of that, the materials list are also quite simple. In fact, to get started with this amazing DIY project, you will only need large bells, silver pipe cleaners, ribbon, and a hot glue gun. These Disney inspired Christmas ornaments not only look stunning, but they also make for a great guessing game, provided you make them beautiful and obscure. Since the materials list for each Christmas ornament is different, we suggest you head over to the link mentioned below the illustration to learn more. We must say that the creator has done an excellent job in explaining this amazing DIY project. 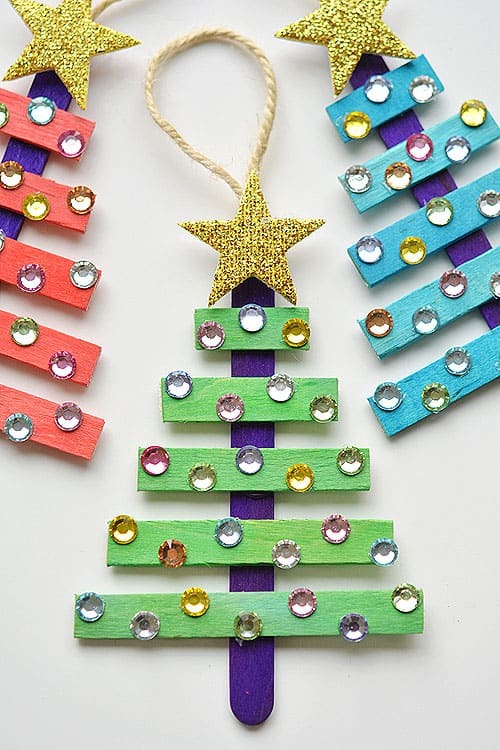 We told you, didn’t we; our list is far from being done with DIY popsicle stick ornament projects. So, here is another amazing Christmas tree ornament made from popsicle sticks and twigs. 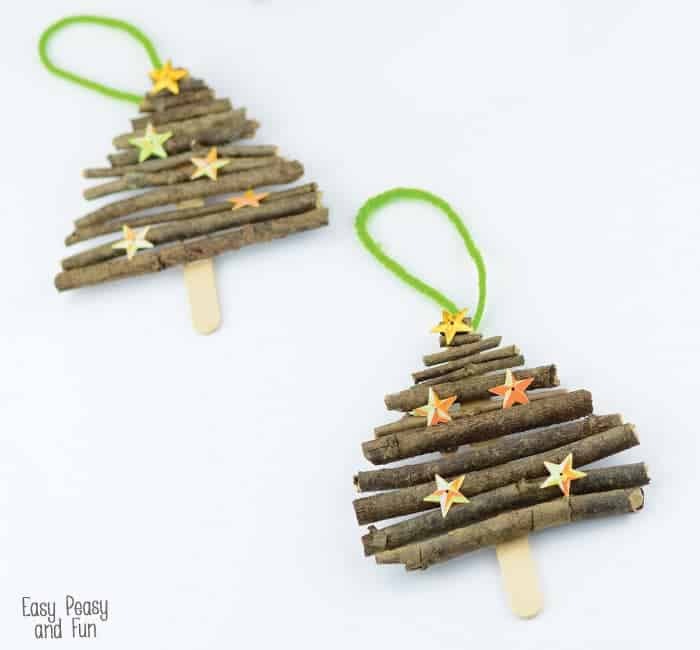 These Popsicle Stick and Twigs Christmas Tree ornaments not only have a rustic charm, but they are also simple to create. In fact, you only need large popsicle sticks, twigs and branches, glue, scissors, yarn, and sequin or other decorations. If the last project featured on our list was too plain Jane for your taste, then this amazing confetti Christmas ornament will surely entice you. Moreover, this is a very straightforward project to create and one that is light on the wallet. To get started with this wonderful DIY project, you will require plain glass ornaments, a package of confetti, mod podge, and a paintbrush. If this amazing DIY idea has piqued your interest, then we suggest you follow the link mentioned below the illustration to learn more about it. While the last project might have been a bit too ostentatious, this amazing DIY idea is understandably beautiful. However, you need a bit more time and effort to execute this to perfection. On the plus side, the list of items required for this project is incredibly simple. In fact, you only need clear glass ornaments, craft paints of your favorite color, thin ribbon, gold leaf, adhesive, and paint brushes. The creator of this project has gone into great depths to explain this amazing DIY idea, and we suggest you click on the link mentioned below the illustration to learn more. 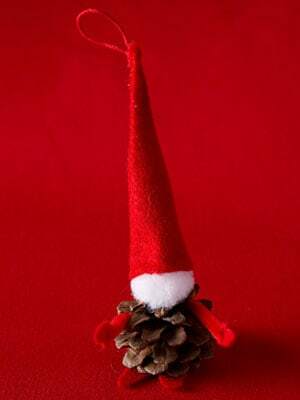 Take a look at this incredibly cute pinecone gnome. Even without a face, it looks quite jolly, wouldn’t you agree? Moreover, a handful of these gnomes will look lovely on your Christmas tree. And, it is simple to make. To get started with this project, you will require a small pinecone, hot glue gun, 1-inch white pompom or a white cotton ball, red felt, scissors, and a red pipe cleaner. Needless to say, all the items on this list are easily available and inexpensive as well. If you are going for a whimsical theme this Christmas, then you surely need to check out this DIY project. 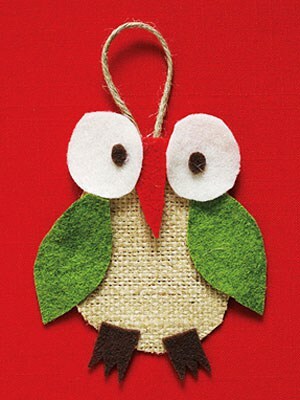 This cheerful Owl Ornament will not only look lovely on your Christmas tree, but is also very easy to make. In fact, all the materials required for this project are readily available and almost have no effect on the wallet. To get started with this DIY idea, you will require off-white, green, brown and red felt. In addition to that, you will also need burlap, scissors, 5 inches of twine, and a hot glue gun. If you like this DIY idea, then be sure to check out the detailed step-by-step instructions by clicking on the link below the illustration. It was only a decade ago that these plastic disks dominated our digital lives. And now, these objects are nothing but useless. Well, at least in the world of tech. However, you can make amazing Christmas Ornaments out of them. 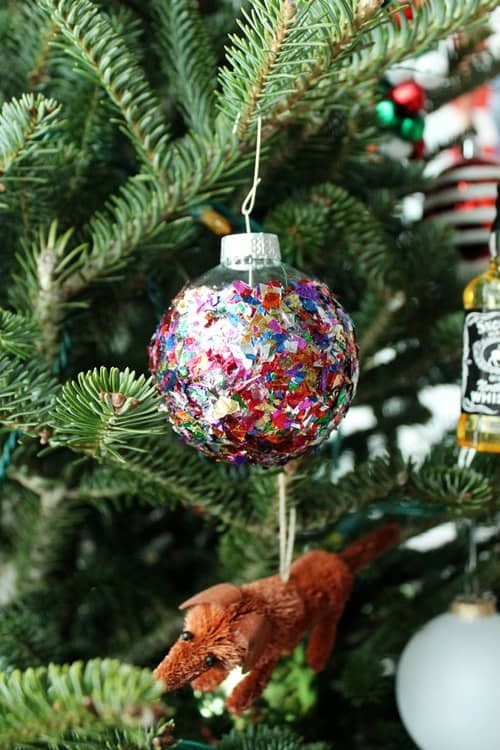 For this DIY idea, you will require glass ornaments, CDs, ribbon, scissors, and a glue gun. That’s all! Pretty simple, right? Although this DIY idea does not require any further explanation, we suggest you visit the link mentioned below the image to thank the creator of this amazing project. 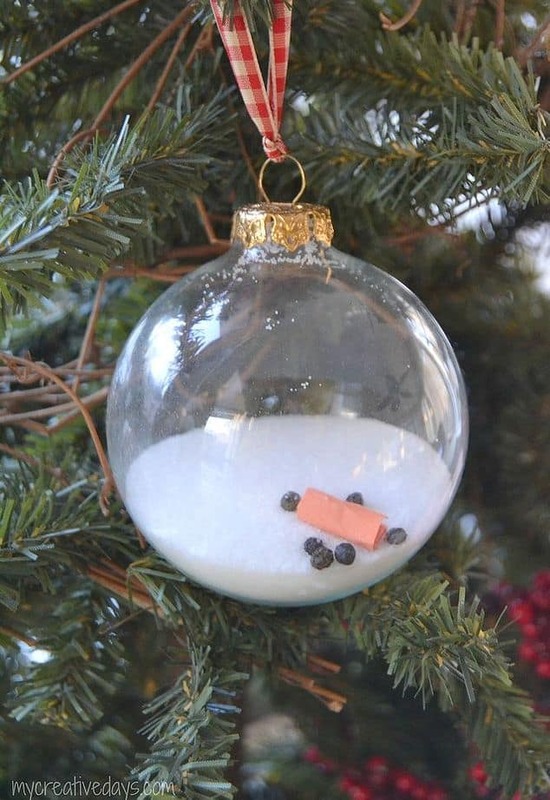 Who would have thought that peanuts could be used as Christmas ornaments? Well, bless Debbie from onelittleproject.com for coming up with this amazing DIY idea. 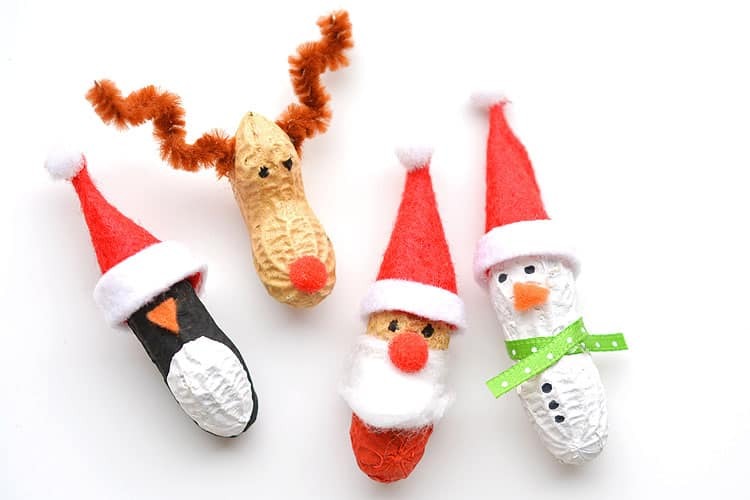 Not only will these Peanut ornaments look wonderful on the Christmas tree, but they are super easy to create. In fact, you can work on this project with your kids. To get started with this project, you will need peanuts, acrylic paint, red, white and orange felt. In addition to that, you will also require white and red mini pom-poms, cotton ball, brown pipe cleaners, black marker, and ribbon. 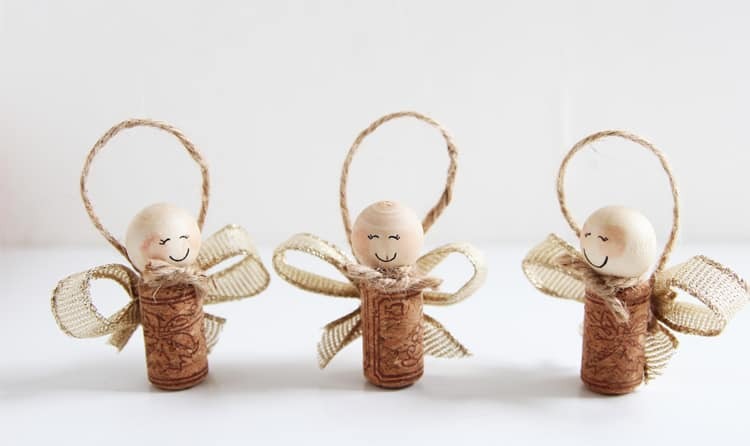 Take a look at these sweet wine cork angels. They look really cute, don’t they? Moreover, they are simple to create and light on the wallet as well. For this beautiful DIY idea, you will need wine cork, twine, wooden ball, ribbons, and a hot glue gun. In addition to that, you will also require black fine-tipped marker, blush, and last but not least, a bottle of matte mod podge. If you love this DIY project, then we suggest you follow the link mentioned below. If you loved the Colorful Melted Bead Ornaments DIY project featured earlier our list, then you surely need to check out this amazing project. 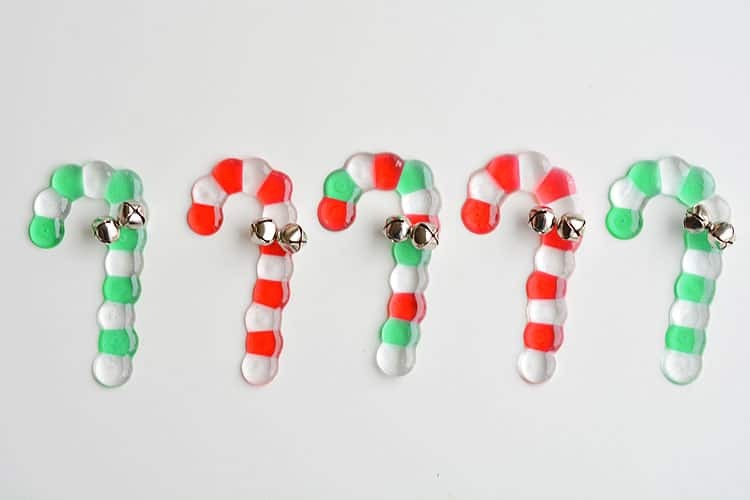 Just like the former, the melted bead candy canes are easy to make. In fact, we believe that this DIY idea is even simpler than the last one. 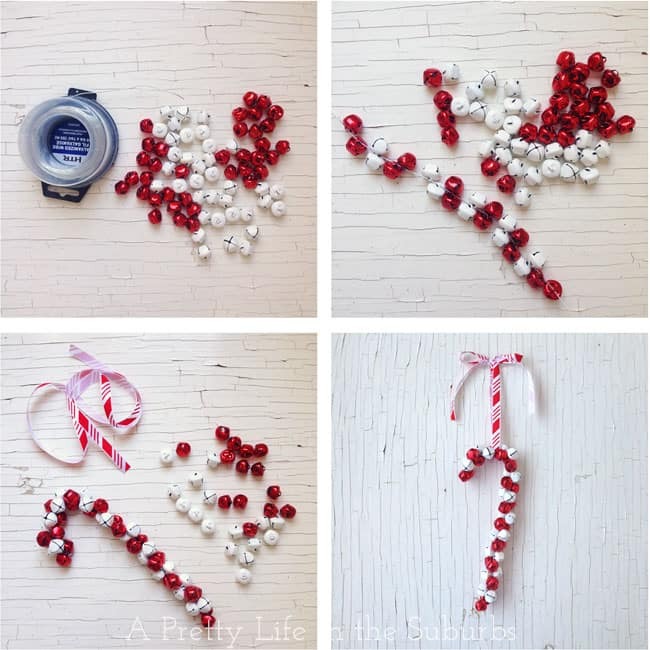 To get started with this project, you will require clear pony beads, fishing line, and silver jingle bells. That’s it! Yet again, Debbie from onelittleproject.com has done a wonderful job, and we suggest you pay her a visit by clicking on the link mentioned below the illustration. These amazing Pom-Pom Christmas Photo Ornaments are a really cool way to express your love for your near and dear ones, wouldn’t you agree? Moreover, they are simple to create and inexpensive! Needless to say, the list of materials for this project are readily available, and you only require a cardboard cereal box, craft knife, pom-poms, photos, ribbon or twine, and a hot glue gun. Take a look at these amazing popsicle stick Christmas trees. We believe that this is surely one of the best popsicle stick ideas we have come across. 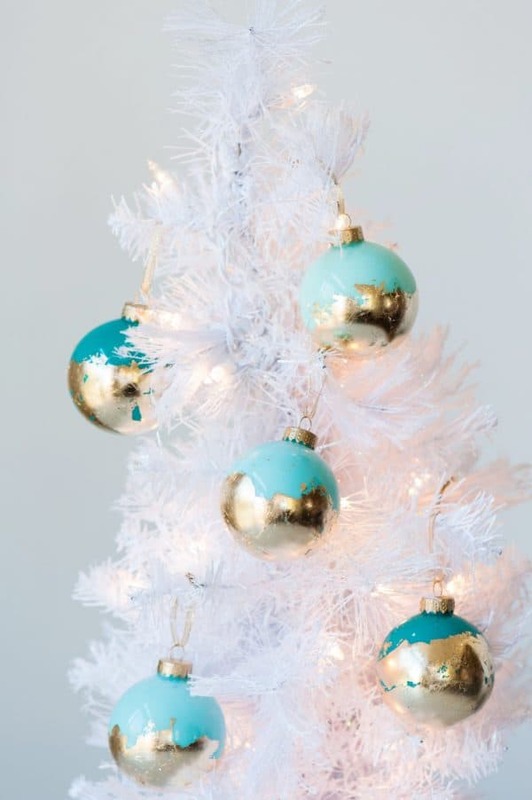 Needless to say, these Christmas trees look incredibly ostentatious, and if that is not appealing to you, then we suggest you check out some of the other understandably cool DIY projects featured here. 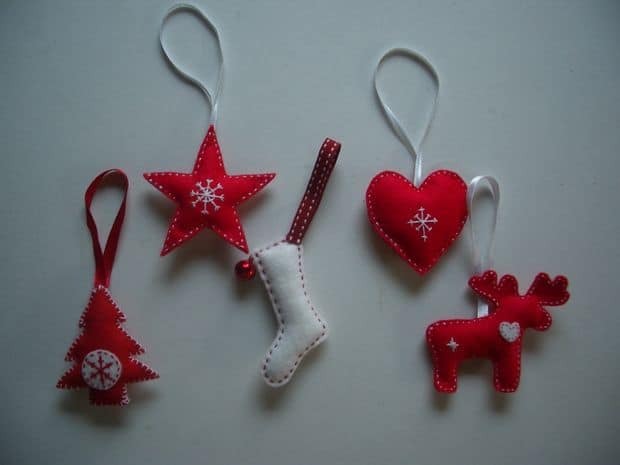 Although these ornaments look sophisticated, they are quite simple to create. In fact, you only need colored popsicle sticks, foam sticker stars, sticker rhinestones, twine, glue gun, and a utility light. If you are love this amazing DIY idea, then why not follow the link mentioned below the illustration to learn more about it? Most of the items featured on our list are about decorating your Christmas Tree, but the Snowflake Window Clings project is quite different. Moreover, they look absolutely adorable, don’t you think? As its name suggests, these Christmas ornaments are primarily for your windows. After all, why should your Christmas Tree get all the love, right? The best part of this project is its simplicity, and all the items required for this wonderful DIY idea are easily available. In fact, you only need Tulip brand puffy paint, glitter, tape, a large freezer bag, and a snowflake template. 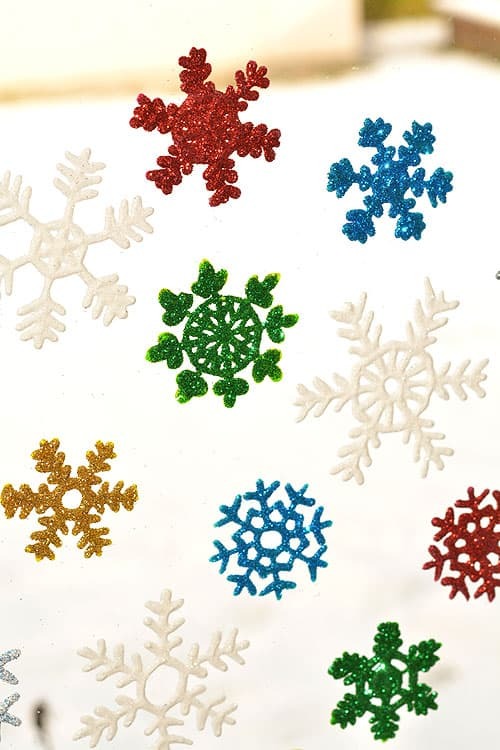 If you want to adorn your windows these glittery snowflake window clings, then follow the link mentioned below the illustration to learn more. The versatility of pine cones means that they are almost as popular as our popsicle stick projects. And here is another cute DIY project made using pinecones. These pinecone elves will not only look lovely on your Christmas tree, but they are also quite simple to make. In fact, you can have a lot of fun creating this amazing project with your kids. 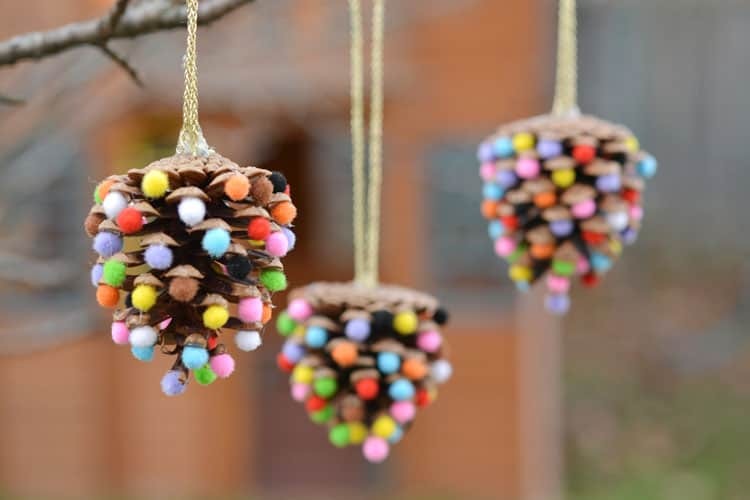 To get started with this DIY idea, you will require small pinecones, wooden balls, felt, hot glue gun, and twine. In addition to that, you will also need black paint or black fine tip sharpie, string and finally, small bells. The detailed step-by-step instructions for this project are mentioned in the link below the image; we suggest you click on it to learn more. The paper snowflakes look stunning, don’t they? 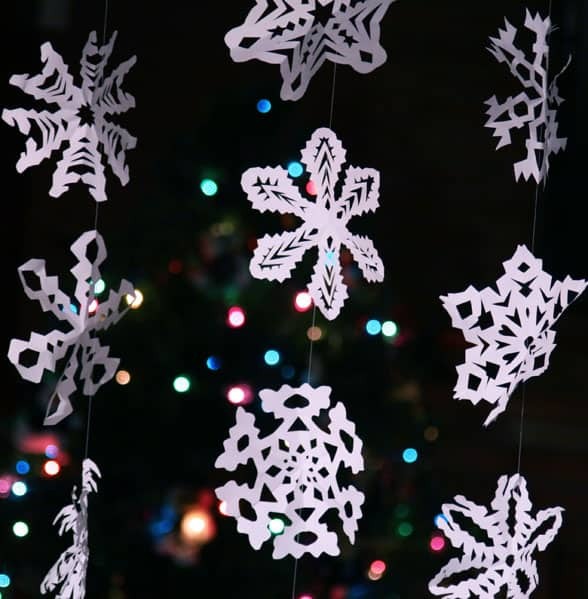 Although they seem quite intricate, these paper snowflakes are very easy to create. Needless to say, the list of materials required for this project is the shortest you will ever come across. Moreover, all the items are probably already available in your home. For this fascinating DIY idea, you will require white paper, a pair of scissors and string. That’s all! If that is not the simplest materials list, then we do not know what is! Ah, Ninja Turtles! They bring back so many amazing childhood memories! And, if that is the case with you or your kids, then you surely need to check out this incredible DIY project. Not only do these Ninja Turtle ornaments look lovely on the Christmas tree, but they are also quite simple to create. In fact, you only need green ornament balls, 0.5-inch wide ribbon in Blue, Red, Orange, and Purple colors, hot glue, and googly eyes. If you love this DIY idea, then be sure to click on the link mentioned below the illustration to learn more about this wonderful project. You might have come across many snowman ornaments, but surely none are as cool and amazing as this one. Despite its sophisticated appearance, it is actually extremely simple to create. Moreover, all the materials required for this project are readily available and inexpensive too. To get started with this amazing DIY project, you will need Decou-Page, frosty snow, two black buttons, orange air-dry clay, red and white pipe cleaners, and red pom-poms. In addition to that, you will also require an electronic tealight, amason jar with lid, and last but not least, a pair of scissors. If you are interested in learning more about this wonderful DIY project, then click on the link mentioned below the illustration. While the list of materials required for this project is surely not the most inexpensive featured here, there is no denying the cool factor of this amazing DIY idea. Moreover, this project is super simple to create, and the hardest part is gathering all the items required for it. In fact, for this DIY idea, you will need polymer clay, DecoArt Metallic paint “Splendid Gold,” Americana paint “Antique Gold,” Decou-Page, two foam brushes, and straw. 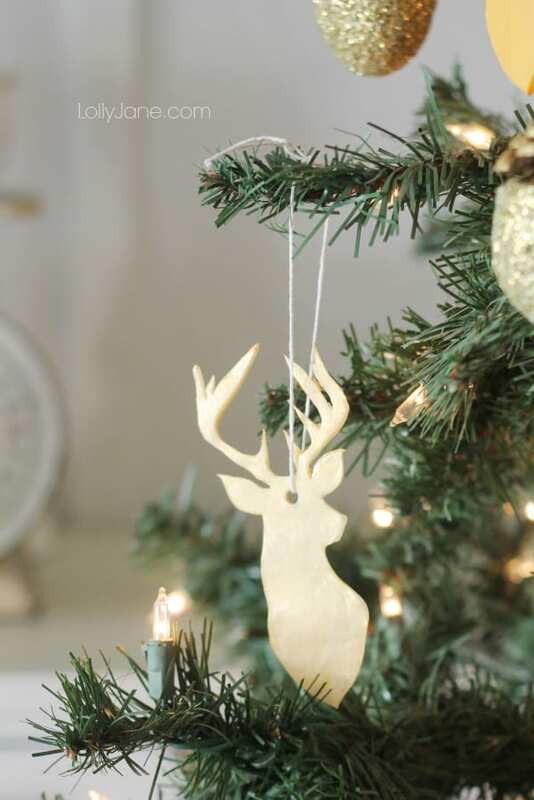 In addition to that, you will also need a printed deer stencil, X-Acto knife, hot glue stick, gold glitter, and finally, white baker’s twine. If you feel that this project is right up your alley, then go right ahead and click on the link mentioned below the illustration. 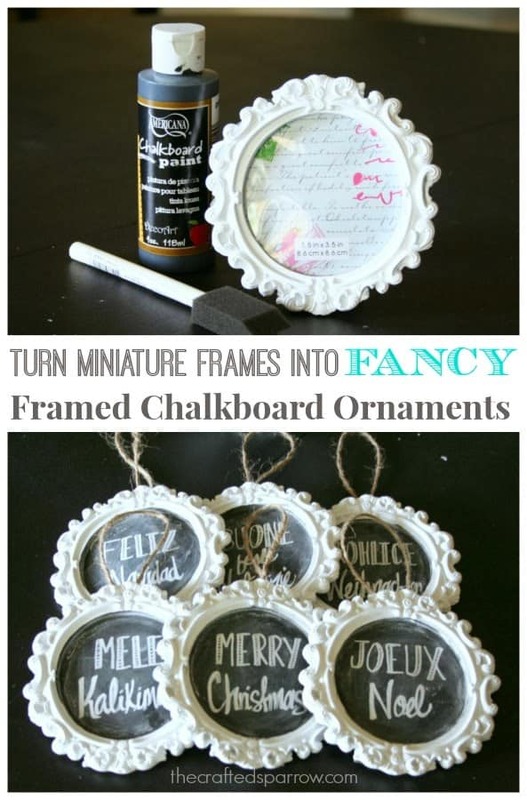 These Fancy Framed Chalkboard Ornaments are an ingenious way to decorate your Christmas tree. Not only do these ornaments look classy and cool, but you can also personalize them to your heart’s content. Moreover, they are quite simple to create and light on the wallet as well. To get started with this amazing DIY project, you will need fancy mini frames, DecoArt Americana Chalkboard Paint, foam brush, baker’s twine, hot glue gun, and last but not least, chalk. Continuing with the understatedly cool theme is this amazing Snowball Ornament. It looks gorgeous, doesn’t it? Although this Christmas ornament looks quite sophisticated, it is actually one of the easiest projects featured on our list. Even the material list is simple! 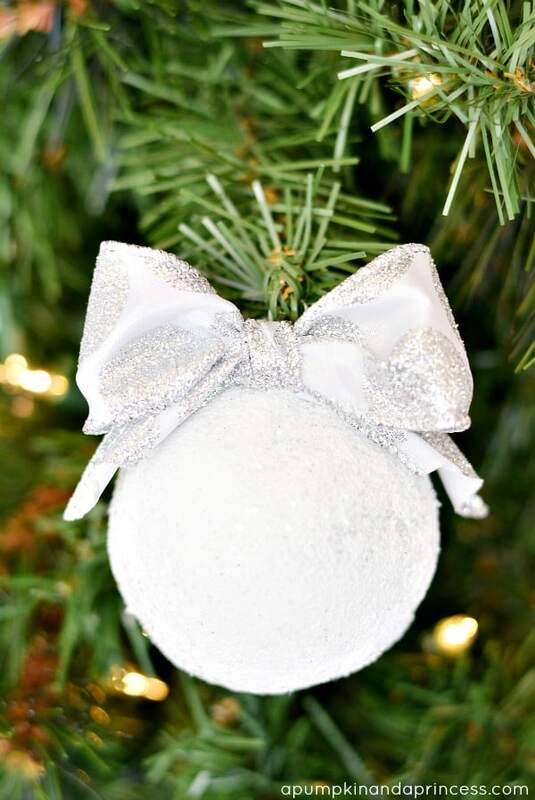 In fact, for this DIY idea, you will only need DecoArt Snow-Tex, clear glass ornaments, foam brush, spray adhesive or Decou-Page, glitter, and ribbon. If you love this DIY idea, then we suggest you click on the link mentioned below the illustration to learn more about it. If you want to work on a project with your kids that have absolutely no chance of failure, then this is it! Moreover, you can make these Cool Reindeer Thumbprint Ornaments in 20 minutes or less! Needless to say, the materials required for this project is extremely simple. In fact, you only need some matte finish ornament balls, a contrasting paint, and red and black sharpies to finish them off. That’s all! Although this project is pretty straightforward, we suggest you pay the creator a visit and leave a thank you note. 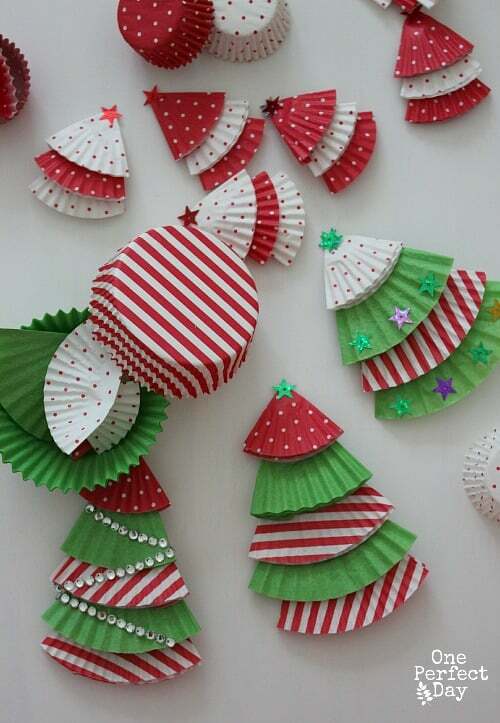 Christmas Tree Ornaments made with cupcake liners? Well, if they look half as cool as the ones featured in the illustration below, then sign us up! Moreover, they are simple to create, and the materials required for this project are light on the wallet. To get started with this project, you will require colorful cupcake liners, glue or adhesive tape, string or ribbon, scissors and decorative items like rhinestones, glitter and other embellishments of your choice. If you love this amazing DIY idea, then we suggest you click on the link mentioned below the illustration to learn more about it. Take a look at these gold clay stars. 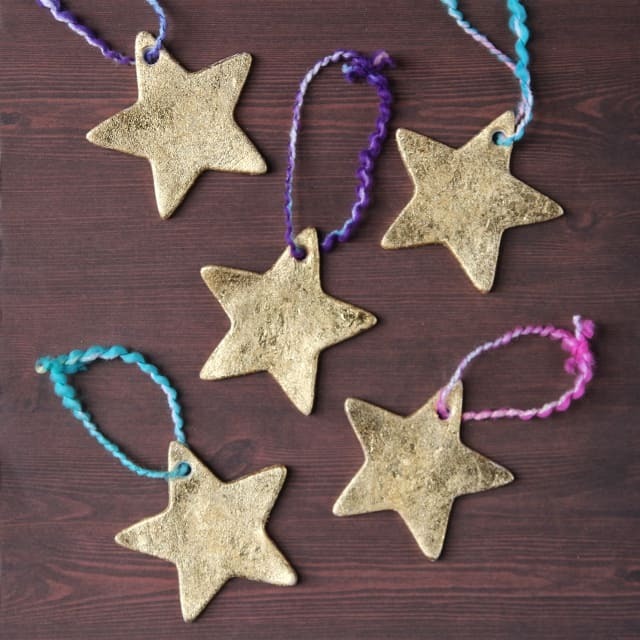 Although these gold clay stars look quite sophisticated, they are easy to make. Moreover, all the materials required for this project are readily available. However, we must say that this project is comparatively more expensive than the ones featured earlier on this list. To get started with this DIY idea, you will require air dry clay, gliding flakes or gold leaf sheets, gliding flake adhesive, star cookie cutter, and parchment/greaseproof paper. In addition to that you will also need sandpaper, sponge, rolling pin, would or ribbon, and finally, straw. Although this beautiful DIY botanical ornament looks like a mini terrarium, it is nowhere as complicated as that. In fact, this is one of the simplest projects featured on our list, and it hardly takes a few minutes to complete a single ornament. Needless to say, the materials required for this project are as simple as they get. In fact, you only need dried cedar leaves, berries, and twigs to bring this amazing DIY idea to fruition. While it is possible to adjust everything using your own hand, we advise you to use a tweezer to makes things more convenient. If you loved the DIY idea, we suggest you follow the link mentioned below the illustration and shower the creator of this wonderful project with your words of gratitude. 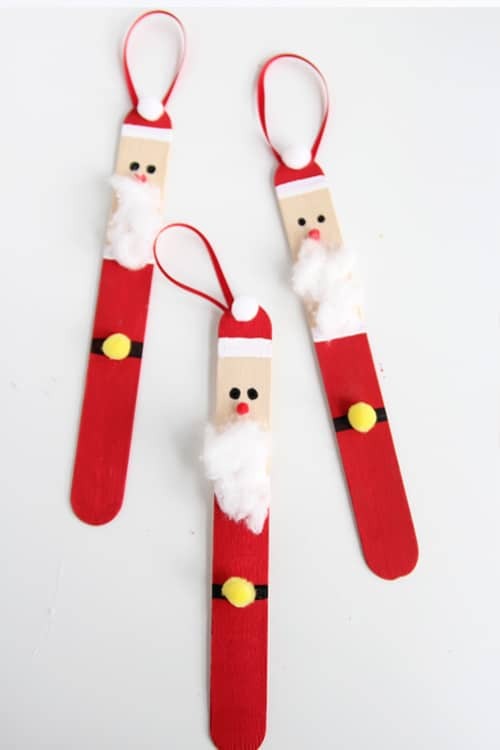 Take a look at these Cinnamon Stick Christmas Tree Ornaments. They are cute, aren’t they? Moreover, these Christmas ornaments are very simple to create, and the materials required for this project are light on the wallet as well. To get started with this project, you will require 3-inch cinnamon sticks, assorted buttons, 4-inch Canadian Pine Garlands, wire cutters, twine, and ruler. Simple, right? If you love this amazing DIY idea, then click on the link mentioned below the illustration to learn more about it. 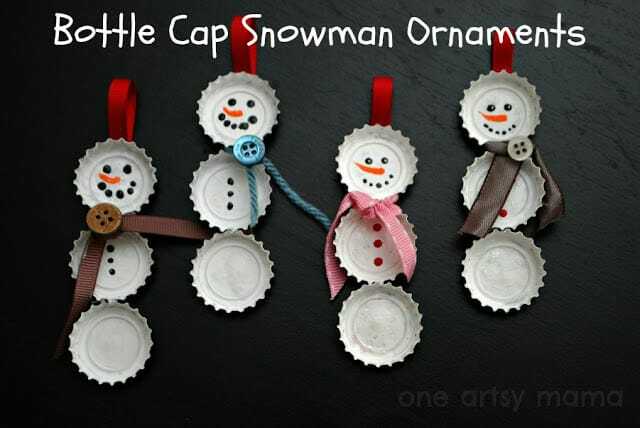 If you loved the DIY Bottle Cap Snowman project featured earlier on this list, then surely need to check out this cute and funny idea. 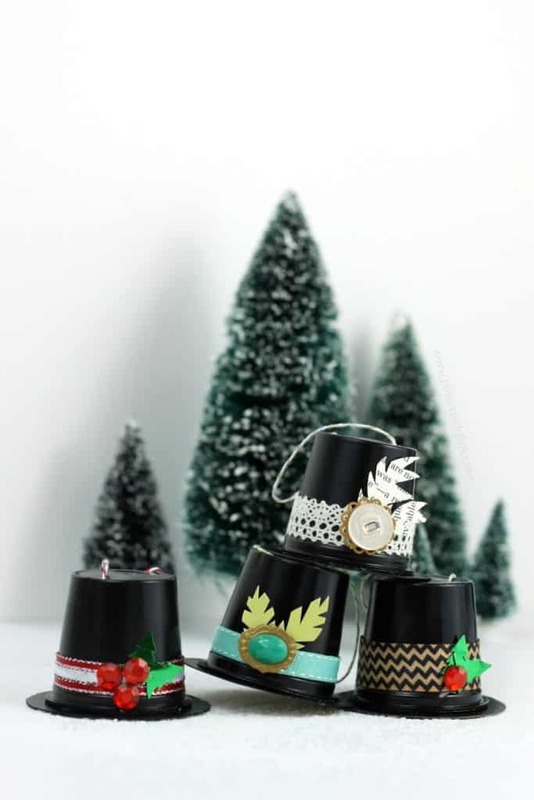 These whimsical bottle cap ornaments are not only easy to make, but the materials required for this project are super easy. In fact, you only require bottle caps, hot glue gun, small googly eyes, small red pom-poms, pipe cleaners, ribbon, and finally, a pair of scissors. Needless to say, this DIY idea is light on the wallet as well. If you are interested in learning about the detailed step-by-step instructions for this project, then follow the link mentioned below the illustration. 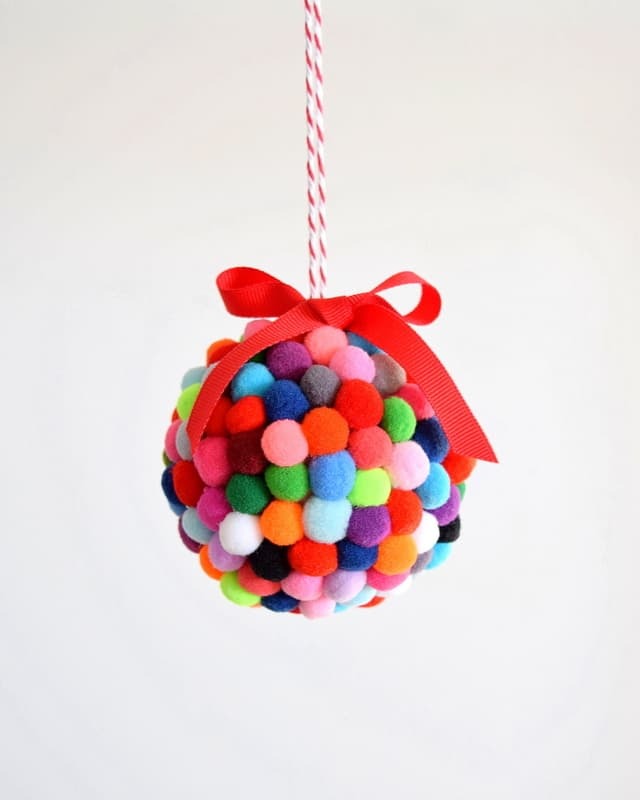 Take a look at this colorful Christmas ornament made with pom-poms. Looks beautiful, doesn’t it? Moreover, they are simple to create, and all the materials required for this project are inexpensive as well. To get started with this amazing project, you will require a wire, wire cutter, and colorful pom-poms. That’s all! If you love this incredibly cool DIY idea, then be sure to click on the link below to find out more about this project. 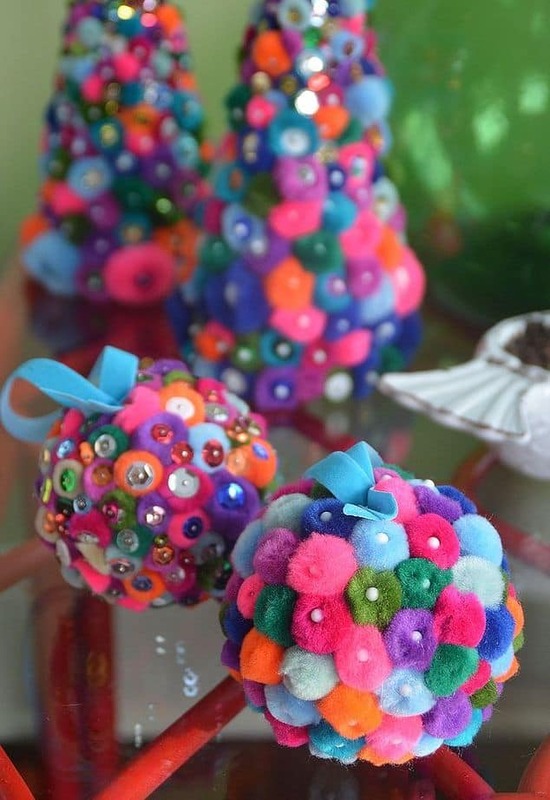 Here’s another wonderful DIY Pom-Pom Ornaments project from the same creator. 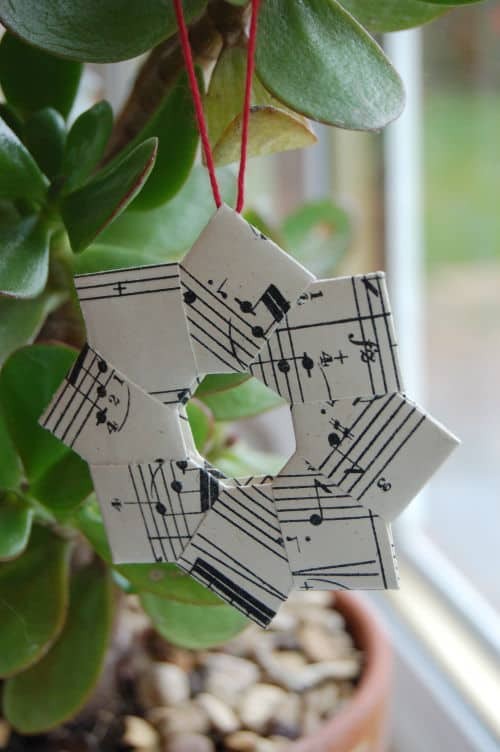 Although this Christmas ornament looks quite complicated, it is actually incredibly easy to make. However, we must say that it is not as simple as the last project featured on our list. 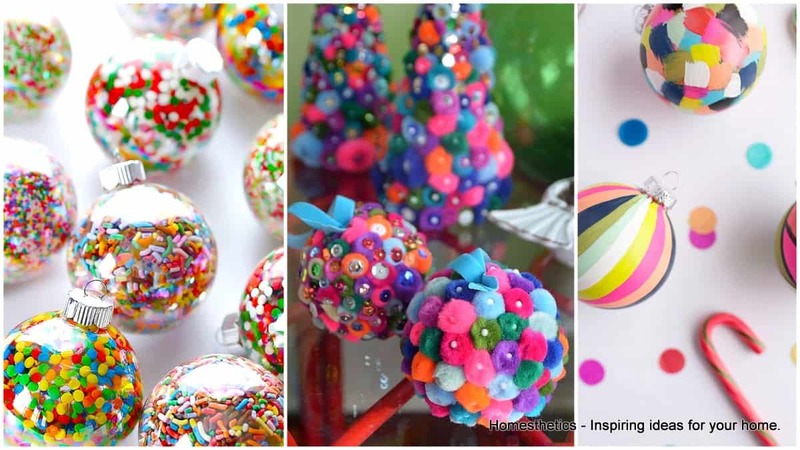 For this DIY idea, you will require colorful pom-poms, Styrofoam balls, and pins. Alternatively, you can use hot glue instead of pins. However, there are some obvious downsides to that. In fact, not only can the glue get messy, but it also means that you cannot reuse the pom-poms for a future project. 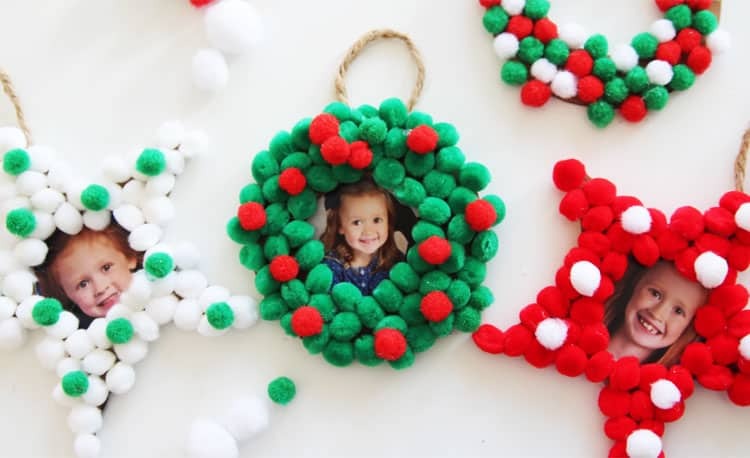 If you loved these wonderful DIY Pom-Pom Ornaments projects, then be sure to head over to the link mentioned below the illustration to thank Alex for her amazing ideas! 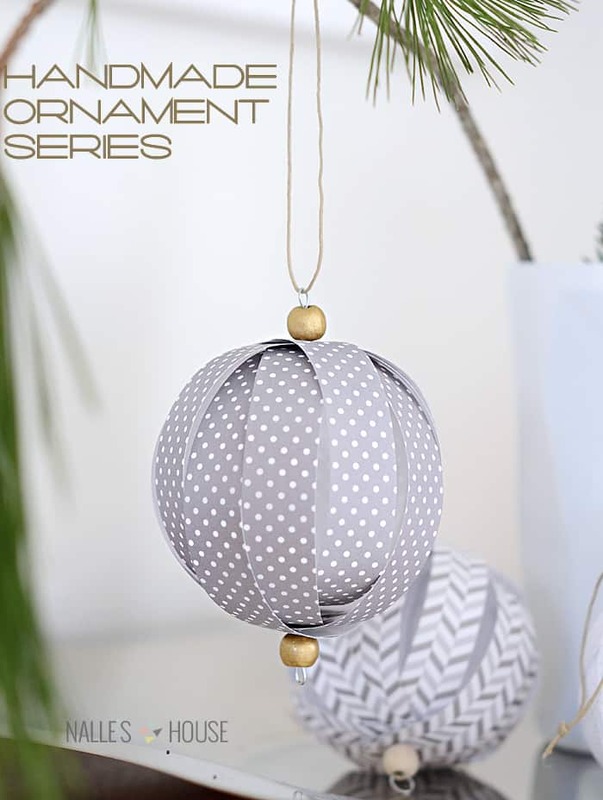 If you love origami Christmas ornaments, then you surely need to check out the next nine DIY projects along with this one. Starting off our origami Christmas ornaments section are these spectacular diamond ornaments. 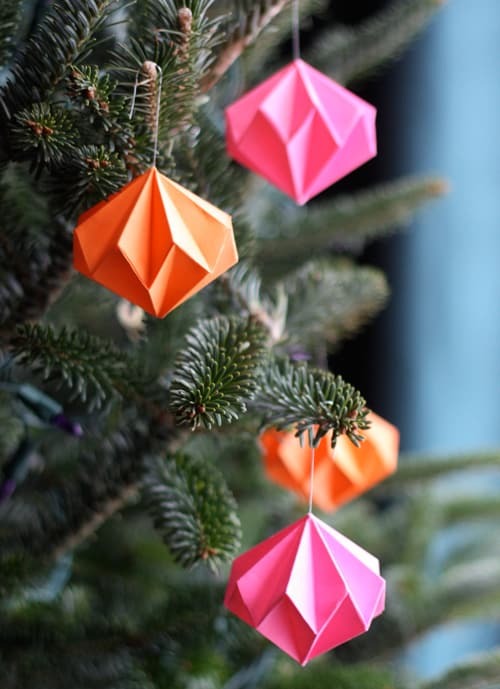 To get started with this amazing DIY project, you will require colorful origami paper, and wire to hang them up on your Christmas tree. Needless to say, this project costs practically nothing, but it is eye-catching nonetheless. If you are interested in learning more about the tutorial, then follow the link mentioned below the illustration. They say, beauty lies in simplicity, and it could not be truer in this case. This origami wreath ornament not only looks understatedly cool, but it is also incredibly simple to make. Moreover, since this Christmas ornament is made of reused materials, it literally has no effect on your wallet. For this DIY idea, you will only need paper and twine. However, you can always go a step further and add some pizzazz with colorful paper and embellishments. If you love this amazing DIY idea, then follow the link mentioned below the illustration to learn more about it. 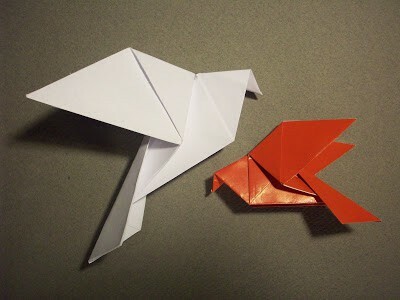 If you have ever delved into the world of origami, you must be familiar with origami birds. If not, then this can be your first experience. And trust us; the world of origami only gets more and more fascinating from here. Needless to say, the list of materials for this project is extremely simple, and you only need colored paper and some string to get started with it. However, if this is too minimalistic for you, then you can always go the extra mile and use some rhinestones and other such embellishments to make it truly stand out. If you want the detailed step-by-step instructions for this amazing project, then follow the link mentioned below the illustration. 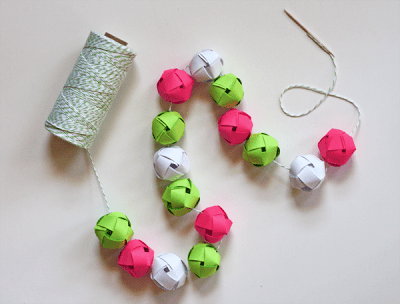 Who would have thought garland made from woven paper balls could look so cool? Although this project is quite simple, it does take a bit of time and effort to execute it. If you fail in your first few attempts, do not worry. Keep at it, and you will surely get the hang of it. For this DIY idea, you will require colorful paper and baker’s twine. That’s all! If the last origami project was not challenging enough, then this one surely will test your mettle. Needless to say, if you make it through to the end, then you will truly experience the state of nirvana. The materials required for this project are exactly same as the last one, and that means you only require colorful paper and string to bring this amazing idea to fruition. 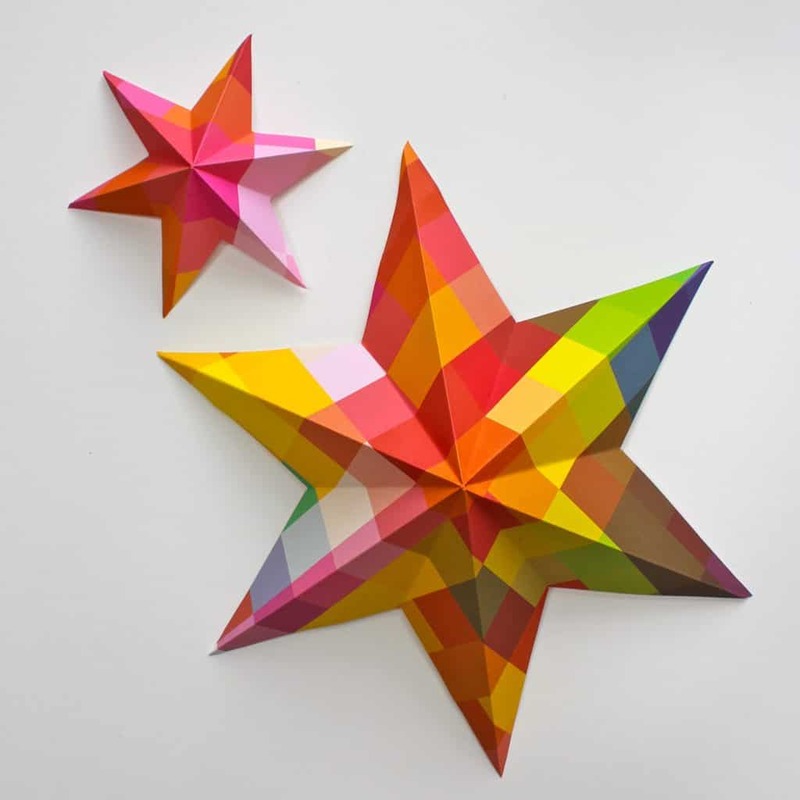 Although the German Paper Stars featured in the illustration below look amazing, you can always take it to the next level by using ostentatious wrapping papers instead of simple colored paper. If you love this amazing DIY idea, then click on the illustration below to learn more about it. Now we know that the last project was quite complicated and, so we have decided to follow it up with an extremely simple one. Although it might be an easy project that does not mean it is not beautiful. In fact, if you like minimalistic things, then you will probably like these ornaments even more. To get started with this DIY project, you will need colorful heavyweight paper, scissors, glue stick or double-sided tape, and finally, white sewing thread. If you are interested in learning more about this amazing DIY idea, then follow the link mentioned below the illustration. 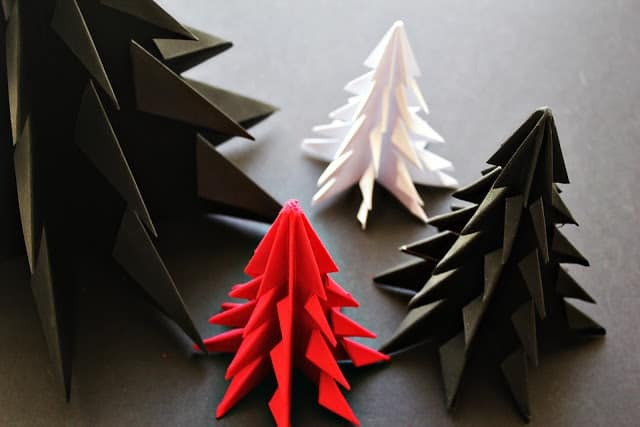 Take a look at these cool origami Christmas tree ornaments. There are absolutely spectacular, aren’t they? Needless to say, this DIY project requires meticulous care to execute to perfection. 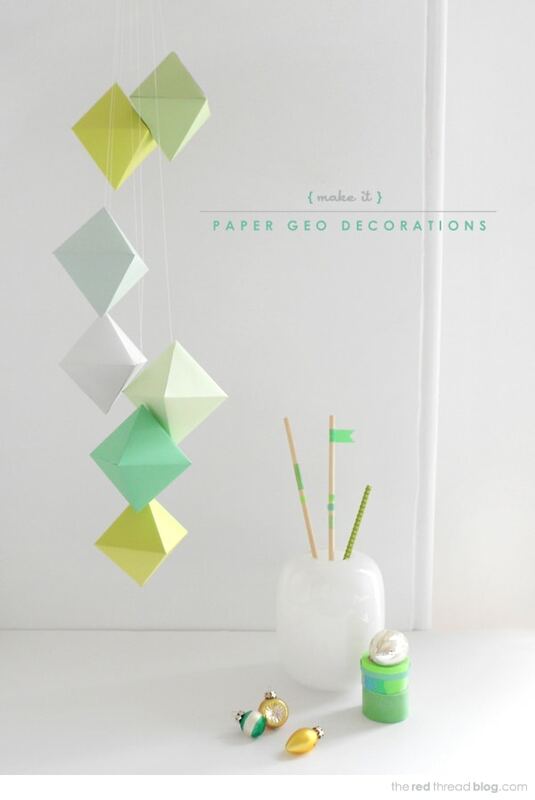 List of materials for this amazing DIY idea is simple, and you will only require colorful origami paper and scissors. That’s it! If you love this incredibly cool Origami Christmas Tree Ornaments project, then click on the link mentioned below the illustration to learn more. If you thought that the last project was complex, then wait till you see the instructions for this one. Moreover, this DIY origami ball requires pin-point precision and perseverance to bring it to fruition. The only simple thing about this project is the list of materials required for it. To get started with this DIY idea, you will require paper (preferably colorful paper), ribbon, and ruler, and a pair of scissors. 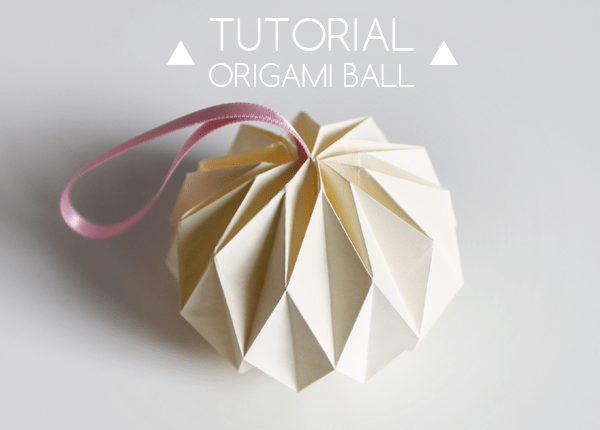 If you are experienced at origami projects, then follow the link mentioned below the illustration to challenge yourself with this incredible DIY Origami Ball Ornament. If not, we suggest you try out some of the other simpler origami projects featured here before you get your hands dirty with this one. Now, now, there is no need to worry. These origami projects are not getting progressively tougher. In fact, this is one of the simplest DIY ideas featured here. However, simple does not mean it cannot be trippy and cool! To get started with this amazing DIY project, you will require colorful wrapping papers, ruler, geometry compass, black pen or pencil, and finally, a pair of scissors. While the list of materials may be longer than the origami projects featured earlier, the instructions for this project is straightforward. 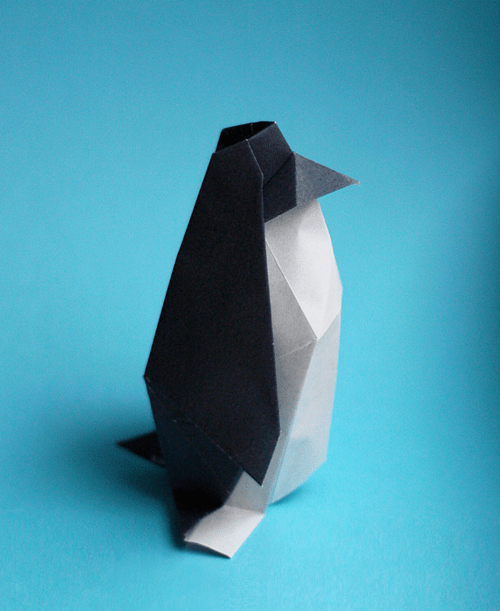 What better way to end our section of origami projects than with this incredibly cool origami penguin ornament? However, we must say that this project is quite complicated for a beginner to handle, and it requires nimble hands and a zen-like state of mind to execute this to perfection. Although this DIY project is quite complicated to make, you will only require a black origami paper for it. This is surely the simplest materials list you will ever come across. If you love this DIY idea, then follow the link mentioned below the illustration for the detailed step-by-step instructions. Humans have been using the combination of black and white since time immemorial. This evergreen relationship is present in almost everything you can think of. So, why wouldn’t you use it in Christmas ornaments as well? Just take a look at the illustration below. These black and white Christmas Ornaments look stunning, don’t they? To get started with this amazing DIY project, you will need white glass ornaments, ribbon, black glass paint and a brush. Quite simple, right? 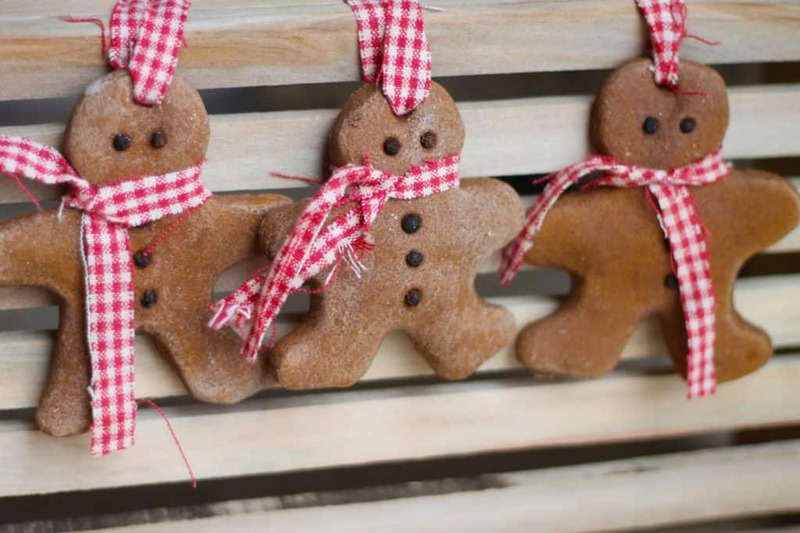 Take a look at these gingerbread man ornaments. They are super cute! Moreover, this DIY project is incredibly simple, and if you have ever made cookies before, then it will be a breeze. For this amazing DIY idea, you will need flour, cinnamon powder, salt, and essential oils of your choice. In addition to that, you will also need cookie cutter in the shape of a gingerbread man, toothpicks, and ribbon or baker’s twine. All the items are readily available, and you should not have a problem in acquiring everything for this project. If you are interested in learning more about the gingerbread man ornaments project, then click on the link mentioned below the illustration. 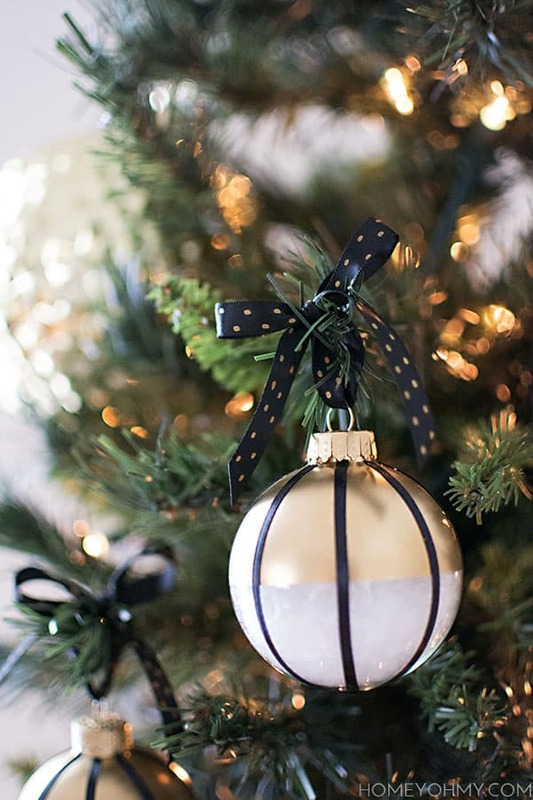 It is hard not to admire these amazing Glittery Marble Ball Ornaments, wouldn’t you agree? Although these Christmas ornaments look quite sophisticated, they are actually easy to make. 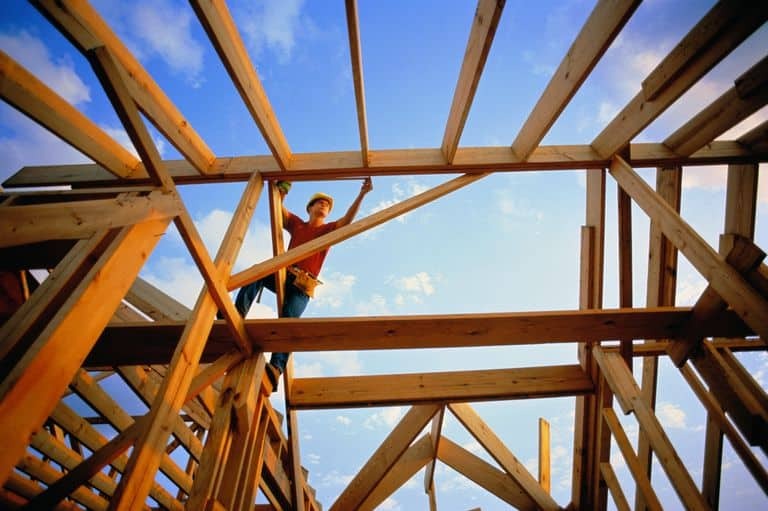 Moreover, the materials required for this project are readily available. But, they are not exactly inexpensive compared to the other projects featured on this list. To get started with this DIY project, you will require tulip fabric glitter, collage pauge, tulip spray dye, clear glass ornaments, nail polish, and a container to catch glitter. If you love ostentatious things, then you will surely admire these amazing engraved and illuminated Christmas ornaments. Not only do they look super cool at night, but they are also quite easy to create. However, you will require a special engraving tool like the Dremel Micro 8050, to bring this amazing DIY idea to fruition. 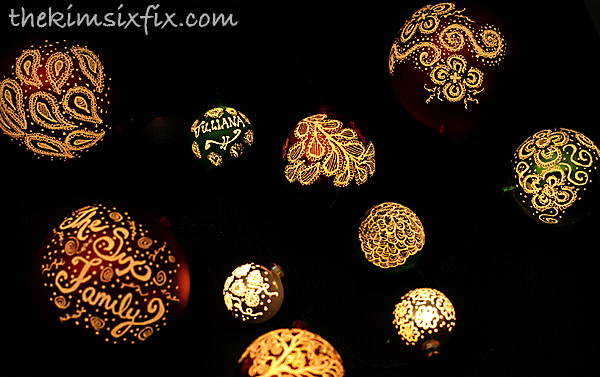 In addition to that, you will also need plastic Ball ornaments and a string of lights. The creator of this project has done an amazing job in explaining it in great detail, and we suggest you click on the link mentioned below the illustration to learn more. 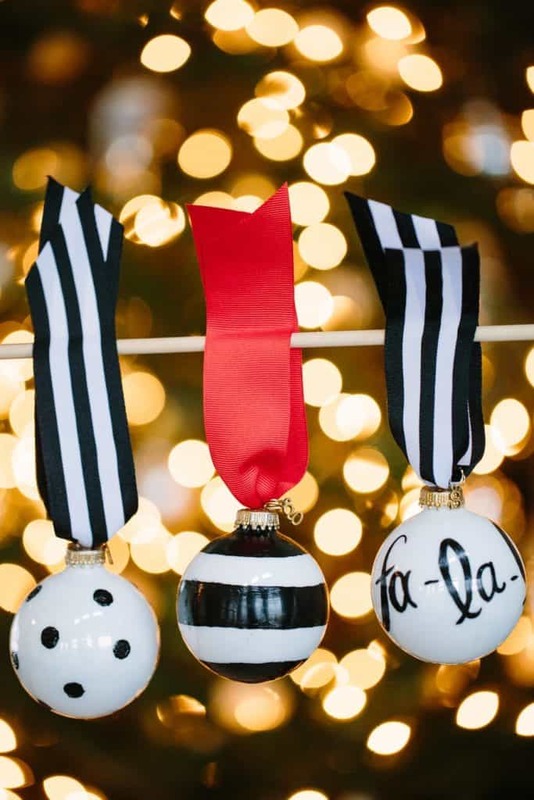 If you loved the simplicity of the black and white Christmas ornaments featured earlier on this list, then you will surely appreciate this amazing DIY idea. 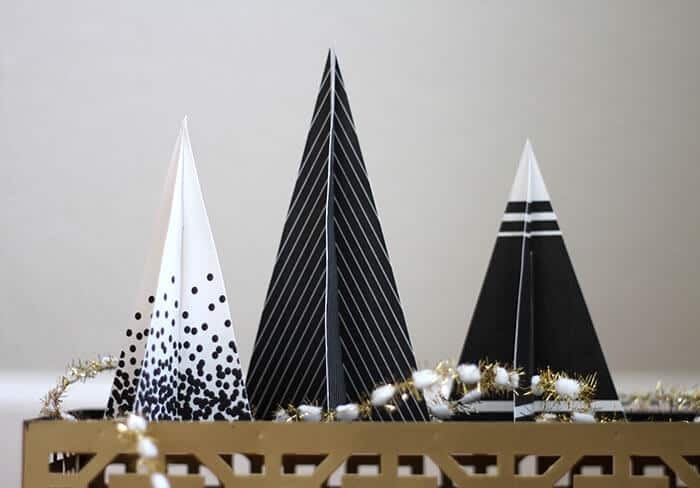 These black, white, and gold ornaments not only look incredibly classy, but they are also quite easy to make. To get started with this project, you will require clear glass or plastic ornaments, Sharpie paint pen, bag of faux snow, and ribbon. In addition to that, you will also require gold spray paint, painter’s tape, aluminum foil, and finally, mod podge. The creator of this amazing project has done an excellent job in explaining the various steps, and we suggest you click on the link mentioned below the illustration to learn more. 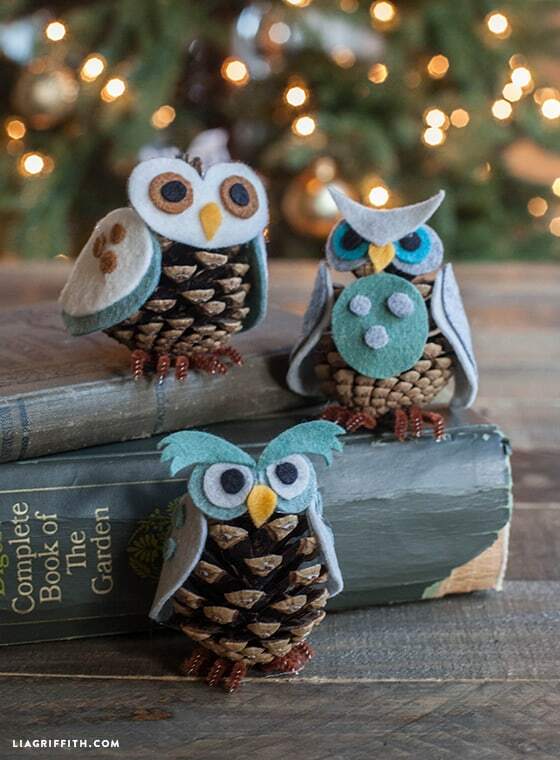 Feast your eyes upon these amazing Pinecone Owl Ornaments. This is surely one of the most innovative DIY Pinecone Christmas Ornaments projects we have ever come across. Not only do they look cool, but they are also quite simple to make. For this amazing DIY idea, you will require a hot glue gun, colorful felt, pinecones, pipe cleaners, and a pair of scissors. Pretty simple, right? If you love this DIY project, then we suggest you head over to the link mentioned below the illustration to learn more. If you want to test your painting skills with an amazing DIY Christmas ornaments project, then this is surely it. 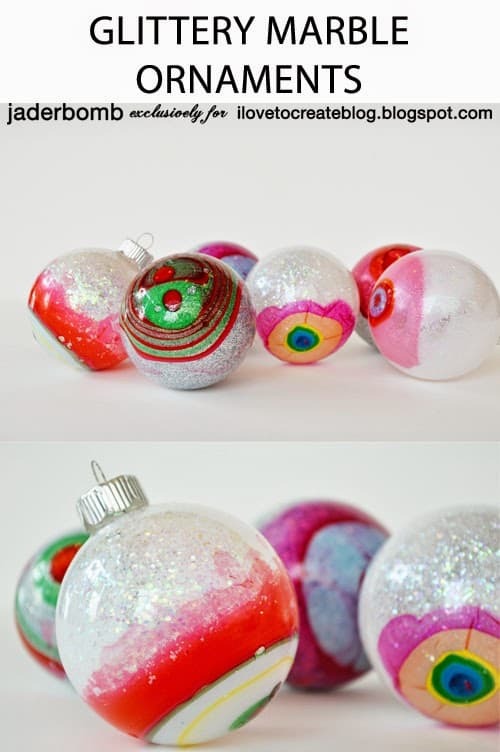 Moreover, these painted Christmas ornaments not only look surreal, but they are also quite simple to make. In fact, unlike most of the other projects featured here, you do not have to follow a fixed path, and you can paint these ornaments in any way you desire. To get started with this wonderful DIY project, you will require paint brushes, acrylic paint, plain glass ornaments, matte mod podge, and ribbon. 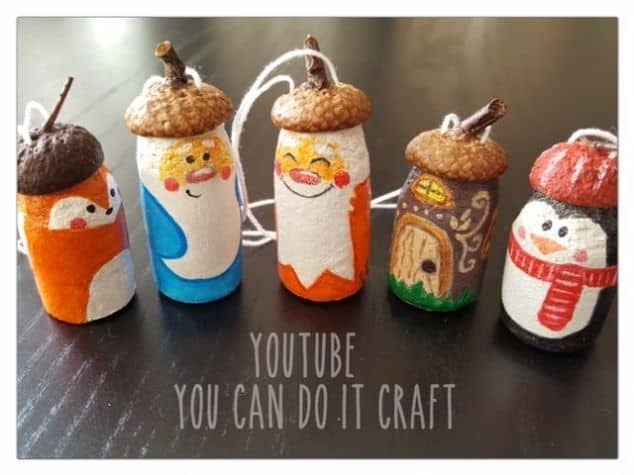 If you are interested in learning more about these amazing Painted Christmas Ornaments, then follow the link mentioned below the illustration. If you loved the last DIY Christmas ornaments project, then you surely need to check out these amazing Brushstroke Ornaments. In fact, we believe that these ornaments will look amazing alongside the Painted Christmas ornaments. For this amazing DIY idea, will require white ceramic ornaments, acrylic paint, matte mod podge, fine glitter, liner paintbrush and ribbon. The detailed step-by-step instructions are mentioned in the link below the image, and we suggest you click on it if you are interested in this brilliant DIY project. If you love all things minimalistic, then this amazing DIY project will surely appeal to your tastes. Needless to say, these contemporary Christmas Tree ornaments are incredibly easy to make, and the materials list is simple as well. In fact, to get started with this DIY idea, you will require white cardstock, scissors and glue stick. In addition to that, you will need to get the patterns printed on your cardstock. You will find the detailed step-by-step instructions along with the templates in the link mentioned below the illustration. And, we suggest you click on it if you are interested in learning more. 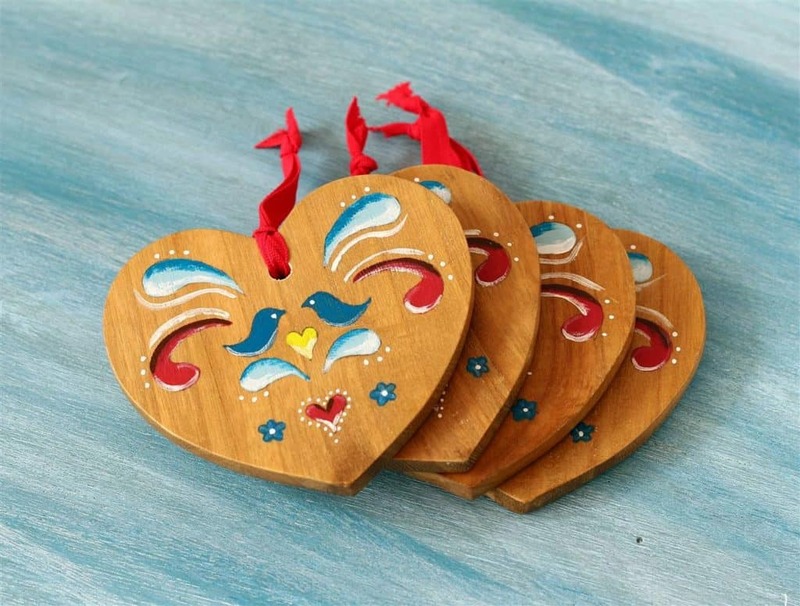 Take a look at these painted heart ornaments. They are beautiful, aren’t they? Although these Christmas ornaments look quite sophisticated, it is actually incredibly simple to make them. And you do not need to be a master painter to bring this project to fruition. For this amazing DIY project, you will require wooden heart cutouts, hand drill, pencil, paper, craft knife, and a pair of scissors. All the items are easily available, and you should not have a problem in acquiring everything. If you are interested in learning more about this wonderful DIY idea, then click on the link mentioned below the illustration. 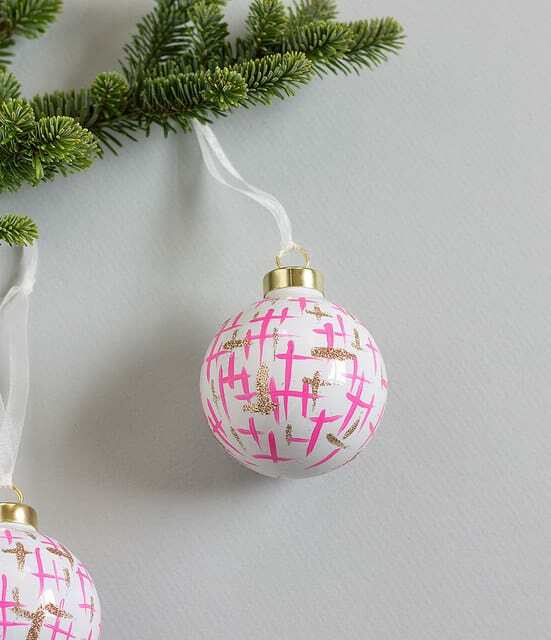 If you want to add some pizzazz to your Christmas ornaments, then this is one simple but cool way to do so. Moreover, this project takes hardly a few minutes to complete. 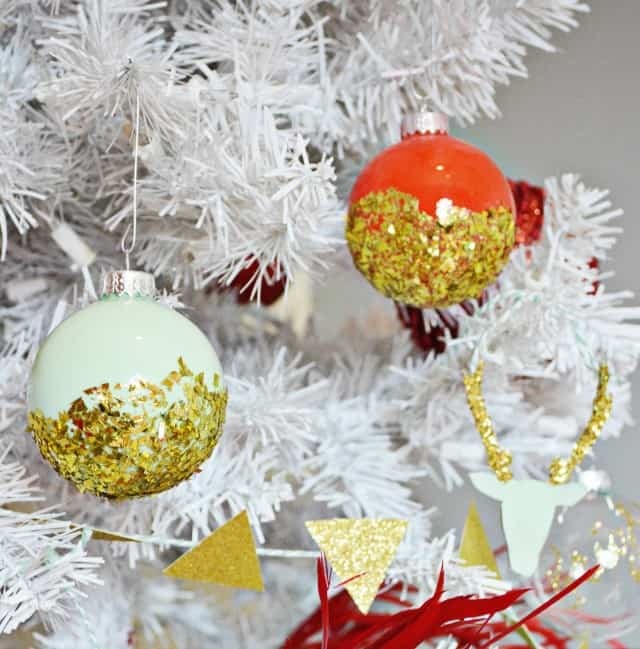 To get started with this incredible DIY idea, you will require clear glass ornaments, acrylic paint in colors of your choice, mod podge, and glitter. The creator of this project has gone into great depths in explaining it, so we suggest you click on the link mentioned below the illustration to learn more. 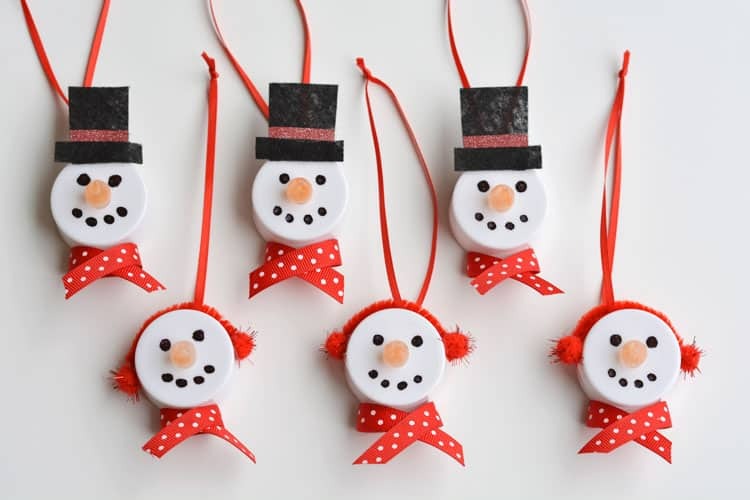 These melted snowman ornaments are not only a cool way to decorate your Christmas tree, but they are also incredibly easy to make. Moreover, the list of materials required for this project is among the simplest featured here. In fact, to get started with this project, you will only need salt, pepper, small strip of orange construction paper and glass ornaments. 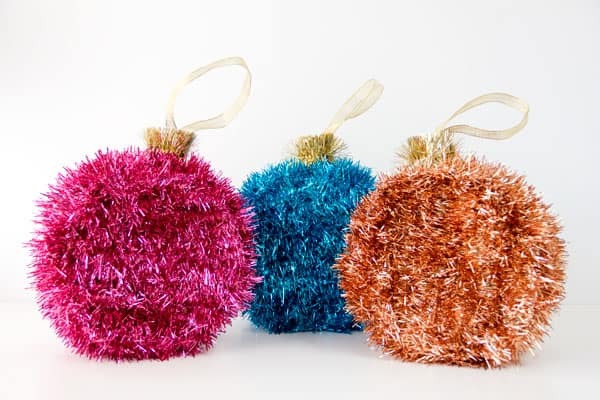 While these pom-pom ornaments are quite similar to the last pom-pom project featured on this list, this one embraces the pins, unlike the former. And that makes these Christmas ornaments much more ostentatious than the last one. The list of materials required for this project is also similar, and that means, you will need Styrofoam balls, metallic pins, sequin in multiple colors, and ribbon. Feast your eyes upon the dwarf and the company. These Christmas ornaments look incredibly cute, wouldn’t you agree? Moreover, they are incredibly easy to make, and the materials required for this project are quite inexpensive as well. To get started with this incredible DIY idea, you will require wine corks, acorn cap, knife, sandpaper (a nail file would also do the trick), acrylic paints, synthetic paint brushes, awl, and last but not least, any strong adhesive. If you are interested in learning more about this amazing DIY project, then we suggest you click on the link mentioned below the illustration. If you love terrariums, then you surely need to check out this amazing Live Christmas Ornaments project. Moreover, this project is incredibly easy to make, and you do not need to be a master at arts and craft to execute this idea. 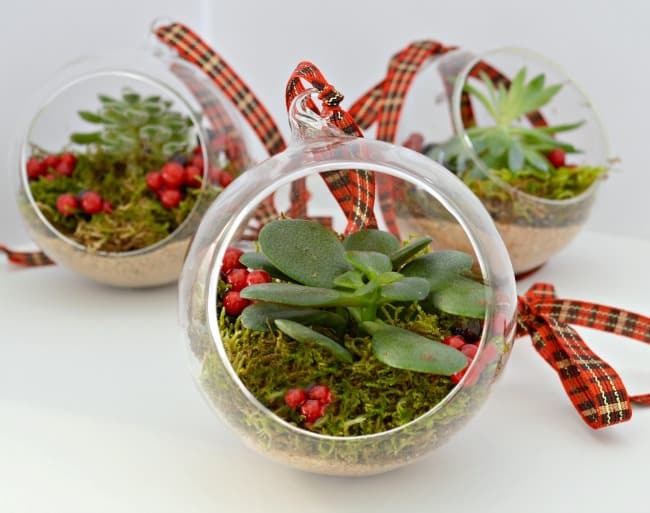 For this amazing DIY project, you will require sand, hanging glass terrarium ornaments, petite succulents, sheet moss, faux berry stem, ribbon, and finally, a spray bottle with water. Quite simple, right? The creator of this project has explained it in great detail, and we suggest you click on the link mentioned below the illustration to learn more. Got a few broken lightbulbs lying around? Don’t throw them away! Instead, you can upcycle them to create amazing Christmas ornaments such as the one featured in the illustration below. Moreover, this project is incredibly simple, and it will hardly take you a few minutes to complete it. To get started with this DIY idea, you will require old light bulbs, red spray paint, ribbon, black electrical tape, and other embellishments of your choice. If you are interested in learning more about this lovely DIY project, then we suggest you follow the link mentioned below the illustration. 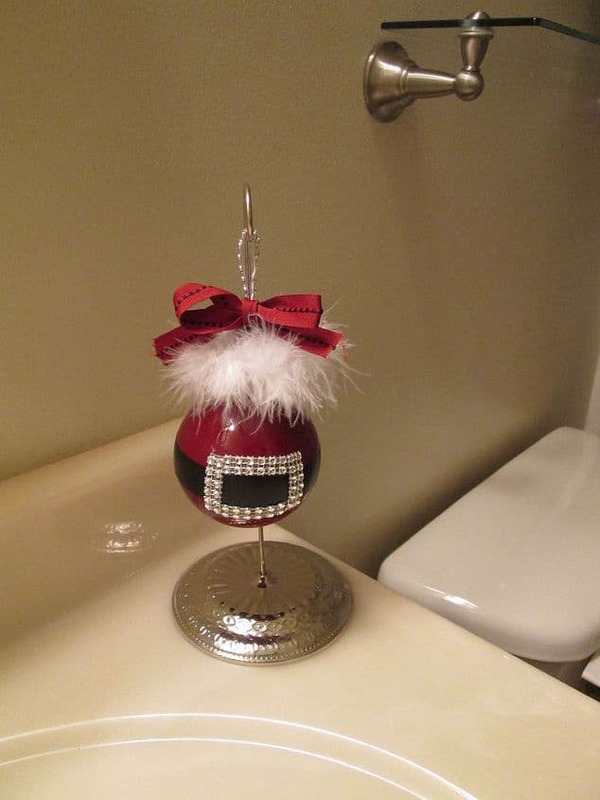 Take a look at this amazing candy cane jingle bell ornament. 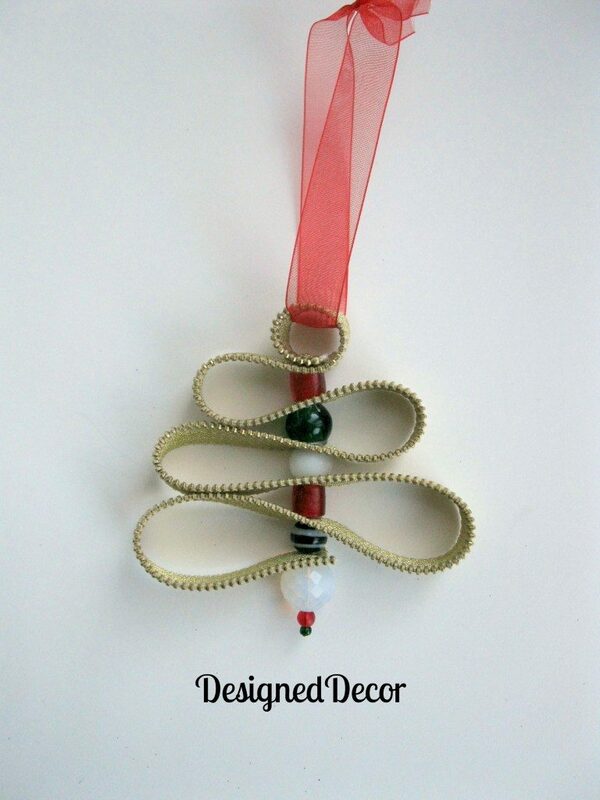 This is surely one of the best candy cane ornament ideas we have ever come across. Moreover, it is incredibly easy to make, and the materials required for this project are quite inexpensive as well. 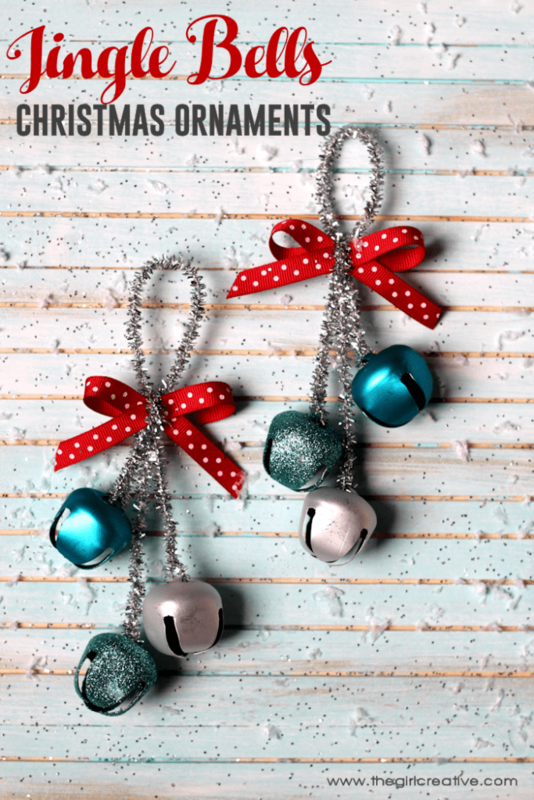 For this incredibly cool DIY project, you will require red and white jingle bells, thick gauge wire, and a pretty ribbon. That’s all! Although we have featured a sprinkles ornament project earlier, we believe that this easily surpasses the last one when it comes to the cool factor. Needless to say, this cupcake sprinkles ornament project is a bit more complex than the former. But it is well worth the extra effort. 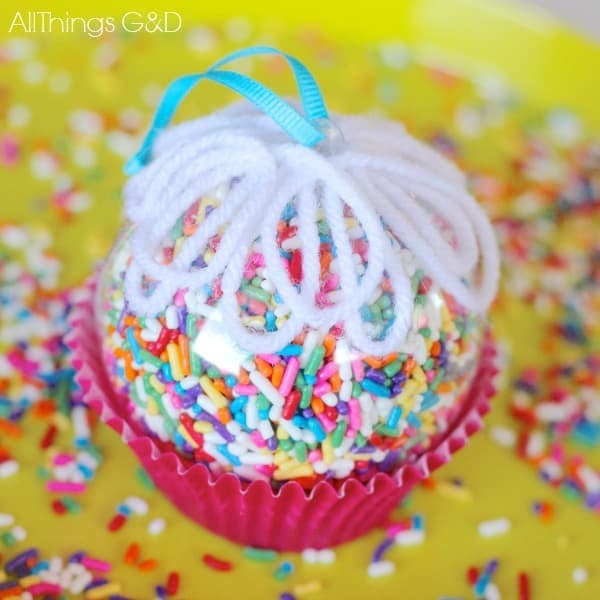 To get started with this amazing DIY idea, you will require clear ball ornaments, sprinkles, paper cupcake liner, yarn, ribbon, craft glue, and a pair of scissors. The creator of this wonderful project has gone into great depths to explain it, and we suggest you click on the link mentioned below the illustration to learn more. 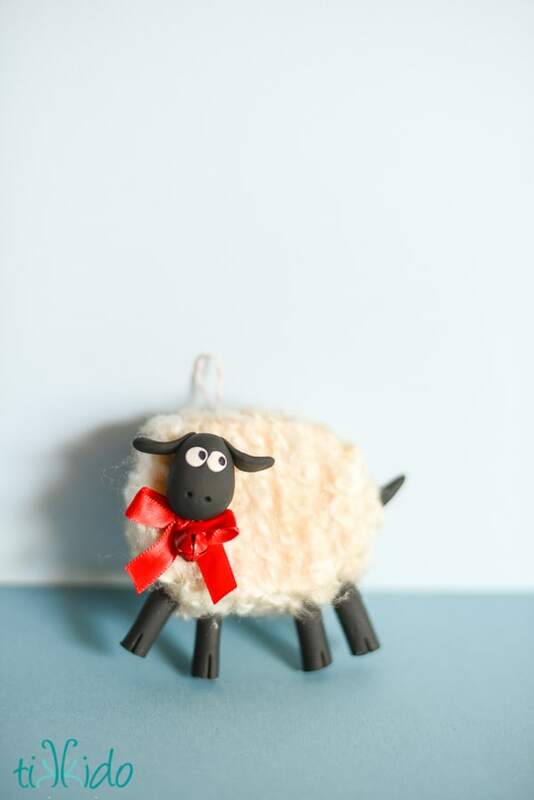 Take a look at this Friendly Sheep Christmas Ornament. He looks incredibly cute, doesn’t he? In case you are worried about knitting techniques, then let us tell you that you do not need any expertise in that field. In fact, this project is incredibly easy to make, and you can finish it in a matter of minutes. The materials required for this project are also quite simple, and you will only colored polymer clay, yarn, Styrofoam sheets, and some embellishments of your choice. Although we do not like picking favorites, the ingenuity of this amazing project means that it is one of the finest DIY Christmas ornaments projects we have featured here. Needless to say, your mileage may vary. Now, we understand that this project looks quite sophisticated; however, it is actually one of the easiest DIY ideas featured here. 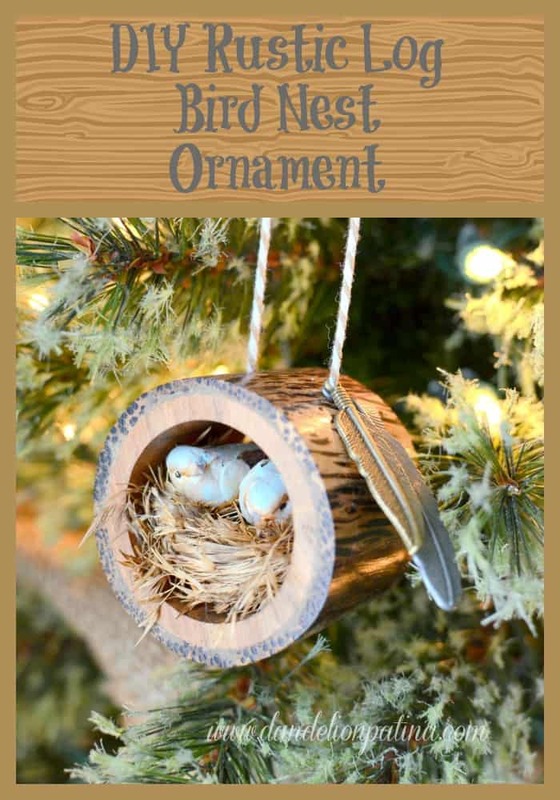 To get started with this amazing DIY idea, you will require wood slice napkin holders, petite birds in a nest, baker’s twine, gold metallic paint, Caribbean blue acrylic paint, and feather charms. In case you have trouble finding the petite birds in a nest, then you can simply make them using colored polymer clay. If you love this incredibly cool DIY idea, then follow the link mentioned below the illustration to learn more about it. 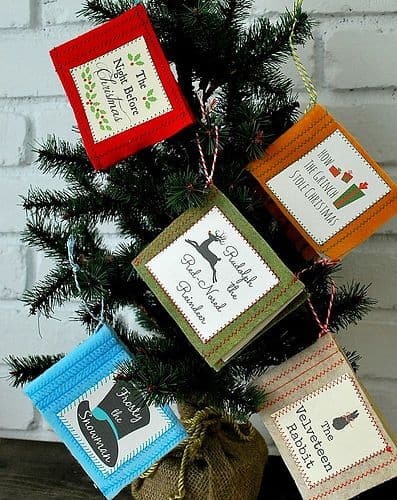 These mini felt Christmas book ornaments look really cute, don’t they? However, we must say that this project is deceptively simple, and you need some prowess and stitching to execute it to perfection. For this incredible DIY project, you will require white paper, 2-inch round hole punch, felt in colors of your choice, twine, sewing machine, and a pair of scissors. 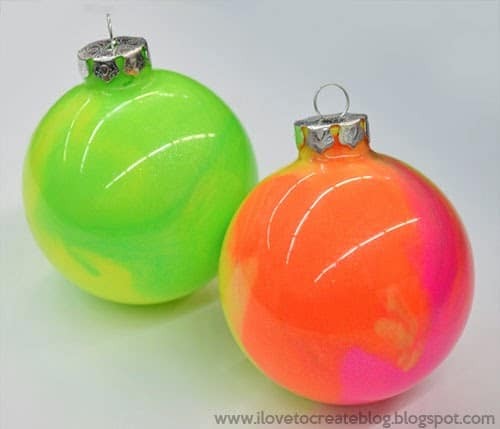 Take a look at these Neon Marble Paint Ornaments. They look stunning, don’t they? Having said that, if you are not a fan of ostentatious things, then you probably want to look at some of the minimalistic DIY projects featured here. The best part of this DIY idea is how simple it is. In fact, the materials required for this project is among the simplest you will ever come across. You will only need Tulip Soft Paint in neon colors and clear glass ornaments. That’s all! If you love this DIY idea, then we suggest you follow the link mentioned below the illustration to learn more. If you avoided the last French Macaroon Ornament project because it seemed too real, then you might want to take a look at this one. Not only does it look amazing, but you also do not have to fear your children feasting on one. Moreover, these ornaments are incredibly simple to make. To get started with this incredible DIY project, you will require bottle caps, sequin and some metallic paint of your choice. Easy enough? Now hold on! Before you move on to the next project, let us tell you that you do not need to be an expert at knitting to bring this amazing DIY idea to life. In fact, this Christmas Ornaments project required no knitting at all! For this amazing DIY project, you will require an old sweater, sewing needle, thread, tiny beads and a fishing line. That’s all! The detailed step-by-step instructions are mentioned in the link below the image, and we suggest you click on it if you want to learn more. 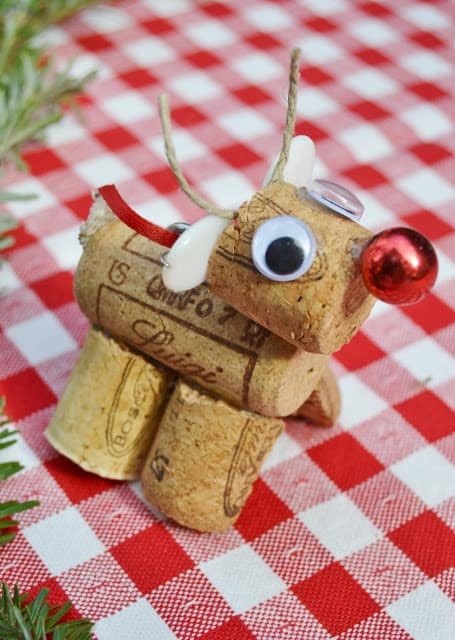 We have featured a couple of whimsical reindeer ornaments made of wine corks; however, this hilarious Christmas ornament is quite different. Moreover, it is incredibly simple to make, and all it takes is a few minutes to complete making a single ornament. 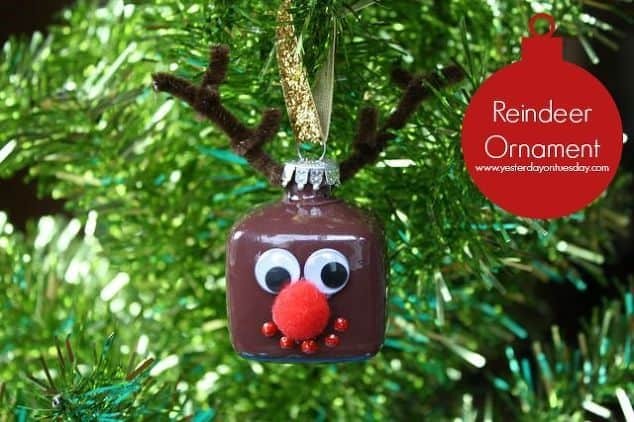 To get started with this incredibly cool DIY idea, you will require a clear glass cube ornament, Tulip Slick Dimensional Paint in Red, brown acrylic paint, a pair of googly eyes, a red pom-pom, brown pipe cleaners, and last but not least, a pair of scissors. If you are intrigued by this amazing DIY idea, then follow the link mentioned below the illustration to learn more. 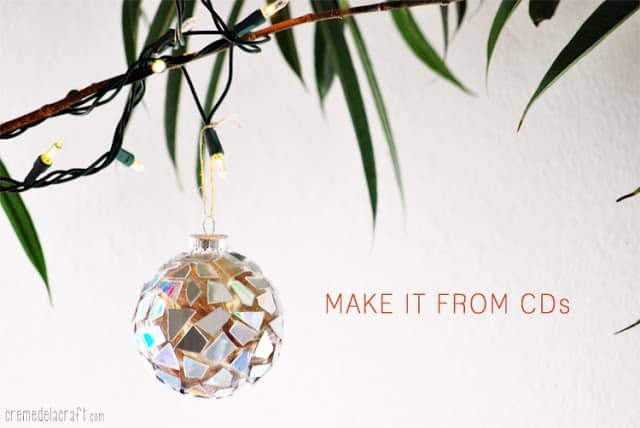 If you love minimalistic Christmas ornaments, then you surely need to check out this amazing DIY project. Needless to say, this is incredibly easy to make, and the materials required for this project are not only easily available, but they are inexpensive as well. In fact, you will require a 24-inch zipper, ribbon, various beads of your choice, hot glue gun, and a pair of scissors. Quite simple, right? The creator of this project has gone into great depths to explain it, so we suggest you click on the link mentioned below the illustration to learn more. 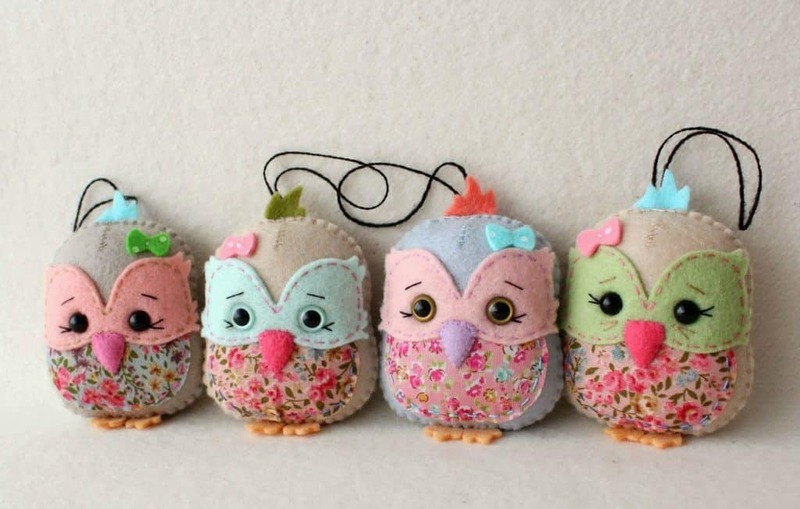 We have featured a few DIY Owl Ornament projects on our list, but none of them even come close to the cuteness of these amazing Christmas ornaments. However, this is not a simple project by any means, and you need to have some prowess in stitching to bring this to fruition. To get started with this project, you will require 4-inch x 6-inch felt for the body, 2-inch x 3-inch fabric for tummy, 2-inch x 3-inch felt for eye patch, scraps of felt for beak, toes, bow, and hair tuft, and a pair of 6 mm black safety eyes or a pair of 7.5 mm colored safety eyes. In addition to that, you will also require embroidery thread or ribbon, polyfill, dried lavender, embroidery scissors, toothpick, Fray Check, and finally a disappearing ink pen. Needless to say, this is the most complicated list of materials we have featured here. If you believe you can take on this DIY challenge, then click on the link mentioned below the illustration to learn more. Now, we understand that the last DIY Owl Ornament project might not have been for everyone and so, we have followed it up with an incredibly easy one. Moreover, it not only looks amazing, but it is mostly made of upcycled materials. For the Snow Owl Ornaments project, you will need cardboard toilet paper tube painted with white craft paint, white cardstock, glittery cardstock, and a small piece of yellow cardstock. In addition to that, you will also require a hot glue gun, gold pipe cleaners, and last but not least, a pair of scissors. 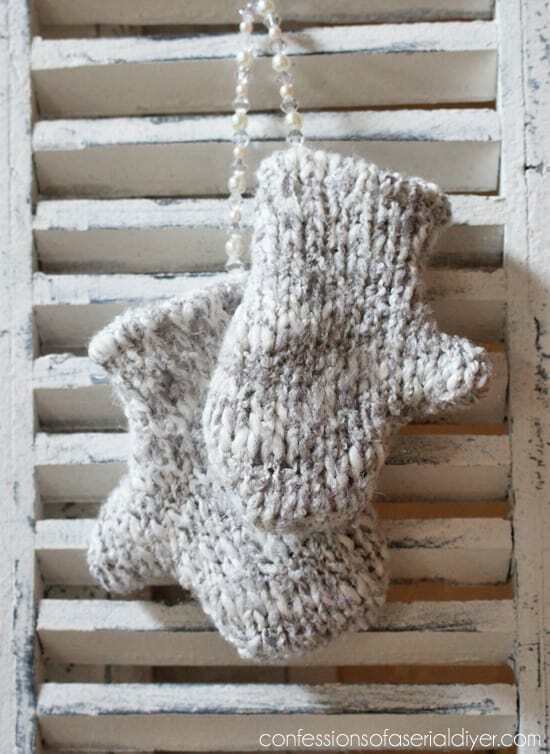 Take a look at these Baby Sock DIY Christmas Ornaments. They are incredibly cute, wouldn’t you agree? Needless to say, you need to have some experience in stitching in order to execute this to perfection. To get started with this amazing DIY idea, you will require felt in various colors, embroidery floss (white, pink, grey, red, blue, green, and black), fiberfill stuffing, baby sock, 5 mm pom-pom, and ribbon. If you love this DIY idea, then we suggest you click on the link mentioned below the illustration to learn more. 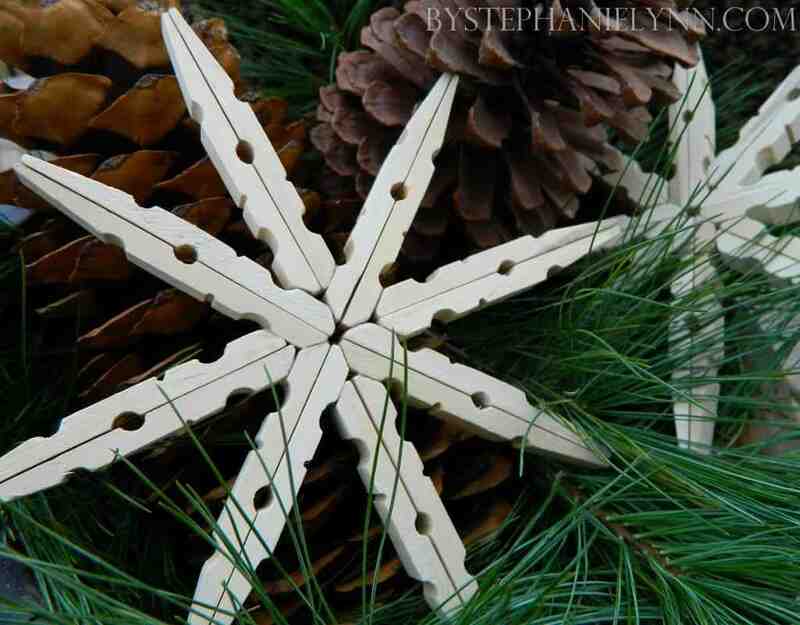 These Frozen Inspired Popsicle Stick Snowflake Ornaments are really pretty, don’t you think? The best part of this amazing DIY project is how simple it is to create. In fact, you will not need more than a few minutes to complete a single ornament. For this amazing DIY idea, you will require mini craft sticks, glue glitter, tacky craft glue, glossy white acrylic paint, and ribbon. That’s all! If you are interested in learning more about this beautiful DIY project, then click on the link mentioned below the illustration. 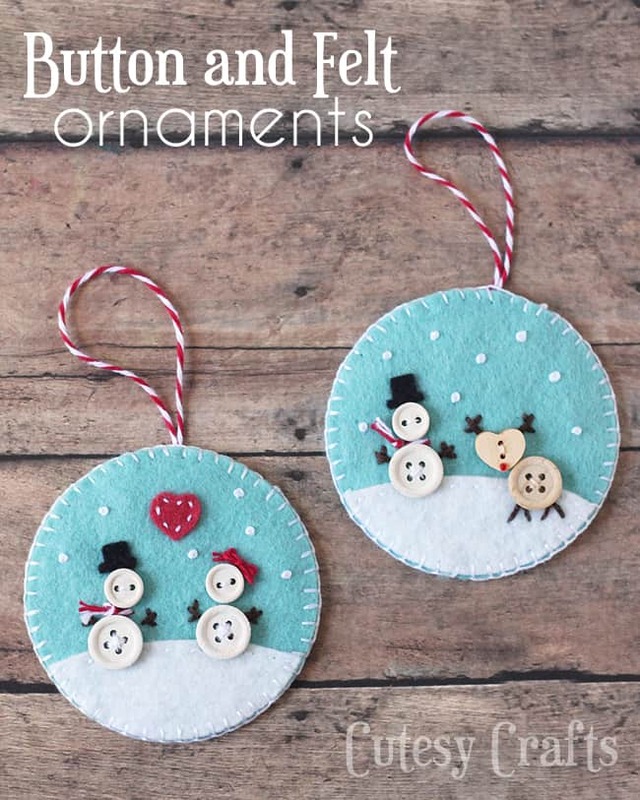 We have yet another incredibly cute DIY Felt Christmas Ornament project for you. Not only do they look amazing, but they are quite simple to create, that is if you know some basic stitching techniques. 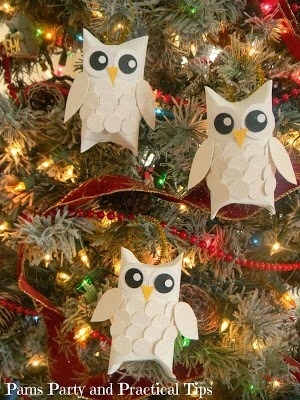 Unlike the overly complicated DIY Felt Owl Ornaments project, the materials required for this are quite simple. In fact, you only need felt in a few colors, buttons, embroidery floss, baker’s twine, small red rhinestone, and last but not least, a pair of scissors. The creator of this project has provided all the necessary instructions to execute it, so we suggest you click on the link mentioned below the illustration to learn more. We have featured quite a few Popsicle Stick Christmas Ornament projects on our list, but none look quite sophisticated as this one. However, despite its sophisticated appearance, it is incredibly simple to make. 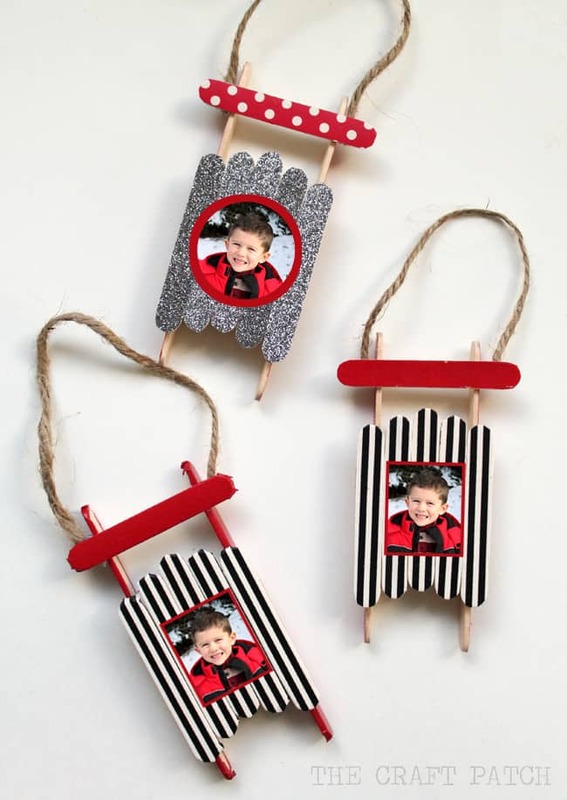 To get started with this amazing DIY project, you will need Washi tape, utility knife, regular-sized craft sticks (3 for each sled), mini-sized craft sticks (6 for each sled), photos of your loved ones, hot glue gun, twine or ribbon, and a pair of scissors. 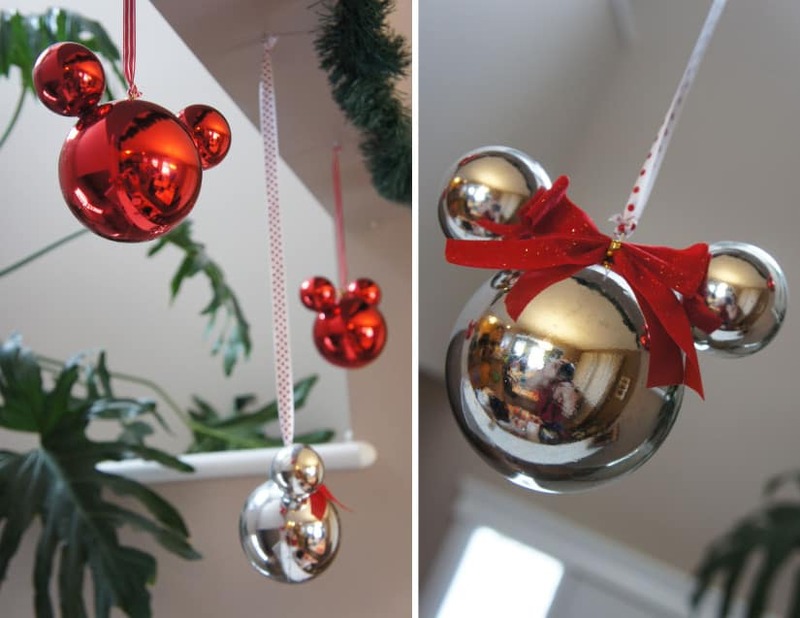 If you are tired of overly complicated DIY projects, then this incredibly simple but cute Mickey Christmas Ball Ornament project will be right up your alley. Needless to say, the materials list for this project is one of the simplest featured here. 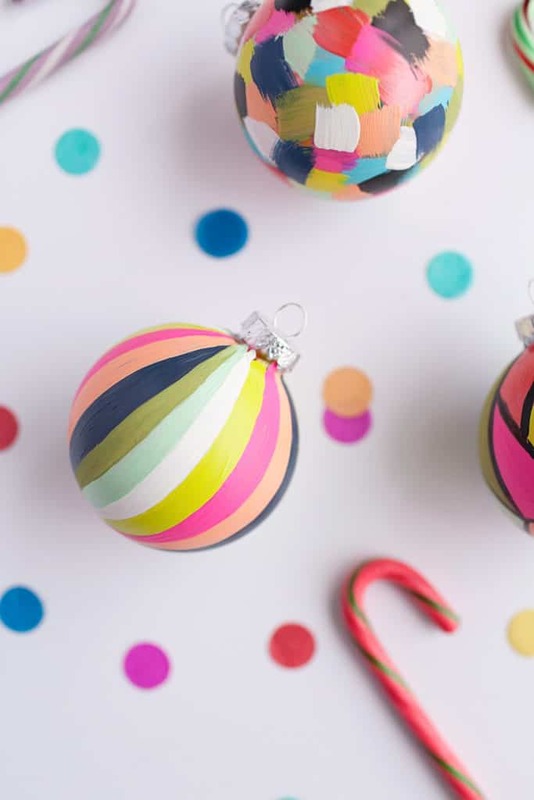 In fact, for this DIY idea, you will only need plastic Christmas ball ornaments (2 small for the ears, and 1 large for the head), sharp knife, bows, ribbon, and a hot glue gun. If you want to try out this DIY project, then follow the link mentioned below the illustration to learn more. 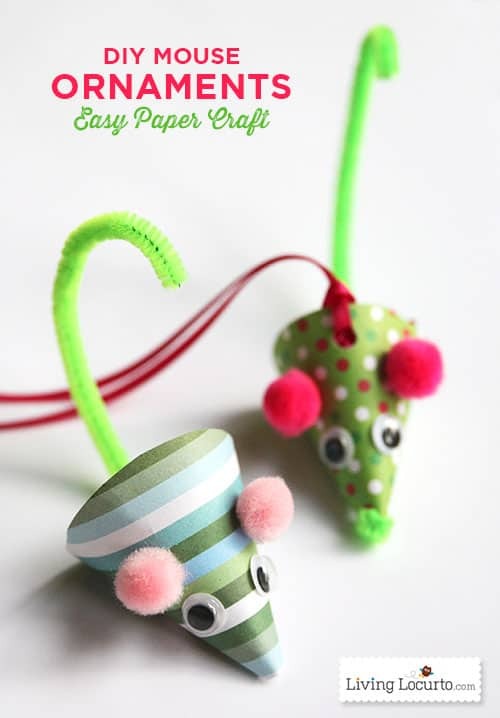 Take a look at these wonderful Paper Mouse Christmas ornaments. They are incredibly cute, aren’t they? Moreover, they are incredibly easy to make, and the materials required for this project are not only simple but also quite inexpensive as well. To get started with this cool DIY project, you will require scrapbook paper, tape, googly eyes, glue, small pom-poms, pipe cleaners, small hole punch, ribbon, and a pair of scissors. You have seen quite a few Mason Jar Christmas Ornaments before, but have you ever seen a Mason Jar Wreath? We guess not. 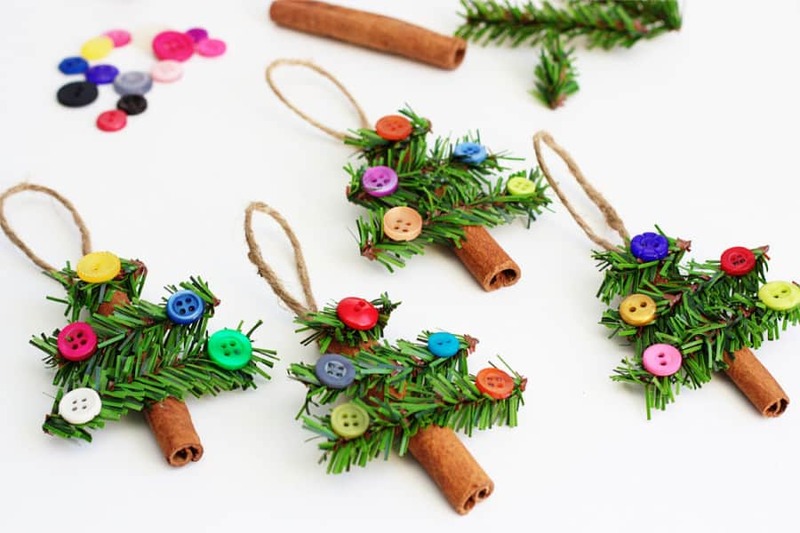 Moreover, these ornaments not only look amazing, but they are incredibly simple to make. In fact, it will hardly take a few minutes to complete a single ornament. For this amazing DIY idea, you will require mason jar lids, jute twine, cotton twine, braided silk cord, some embellishments of your choice, and a pair of scissors. That’s all! If you love this DIY project, then we suggest you click on the link mentioned below the illustration to learn more. Take a look at these Giant Gumdrop Ornaments. They look really delicious, don’t they? Moreover, they are incredibly easy to make, and the list of materials required for this project is not only simple but also light on the wallet. 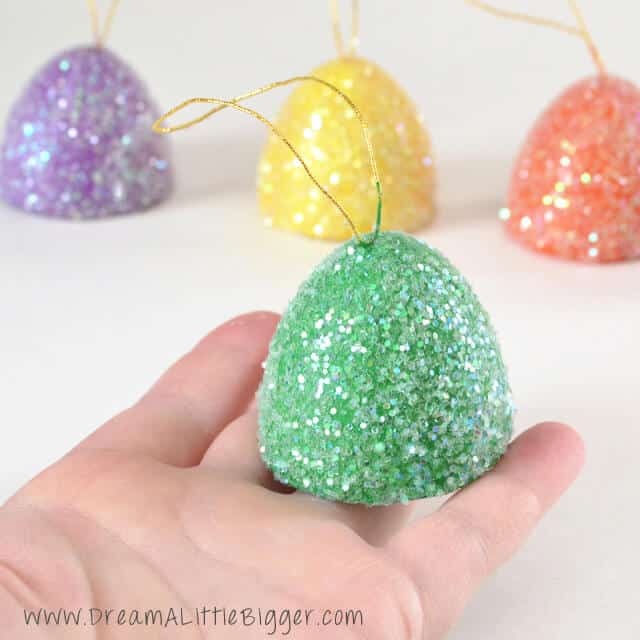 In fact, you will only need papier mache eggs, gold string, X -Acto knife, cardboard or cardstock, hot glue, Decoupage, gumdrop colors of paint, and chunky translucent glitter. If you are interested in learning more about this wonderful DIY project, then we suggest you click on the link mentioned below the illustration. What better way to finish our list than with this incredibly cool Crystal Pendant Family Photo Ornament Project? Not only is it an excellent way to express your love for your near and dear ones, but it is also incredibly easy to make. For this amazing DIY project, you will require Mod Podge Dimensional Magic, metallic silver or gold acrylic paint, chandelier crystals, miniature scanned family photos, pinch bails, crimp bead covers and beads of your choice. 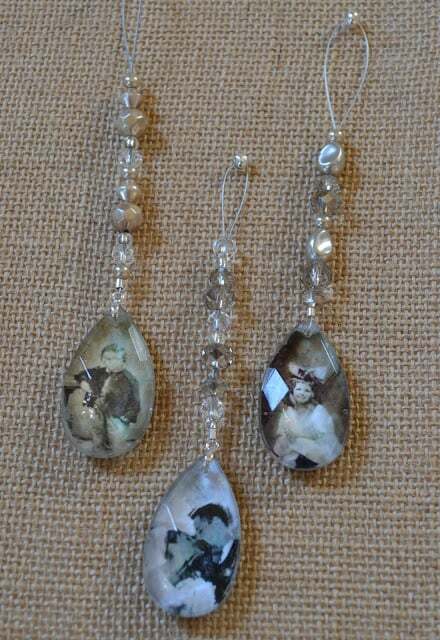 In addition to that, you will also need a pencil, scissors, paper towel, paintbrush, crimp tubes, all in one jewelry pliers, and last but not least, silver or gold beading wire. Phew! That is a long list of items! If you are intrigued by this incredibly cool DIY idea, then we suggest you follow the link mentioned below the illustration to learn more. Compiling 111 DIY Christmas Ornaments was no easy task. And it was not because of a lack of amazing projects. In fact, it is quite the contrary. 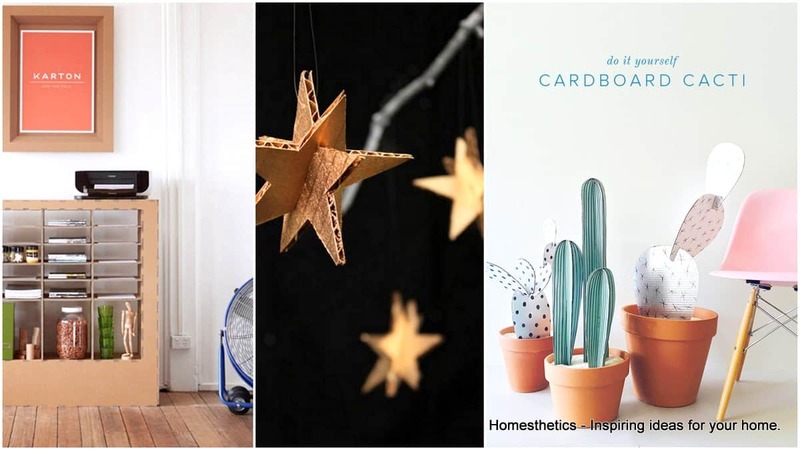 We had to search an endless sea of incredibly cool DIY ideas and pick just 111! But we did it! Regardless, we hope you enjoyed our extensive list and if you plan on executing maybe one, two, or a plethora of ideas from here, do share your finished projects with us. We would love to hear from you.